As I was shivering in a very large metal flying machine I couldn’t help but contemplate what makes us wander from home. I love home and all its familiarities, its comforts and its mundane routines. But I suppose I must have a little adventurous spirit and a desire to see other parts of our world. 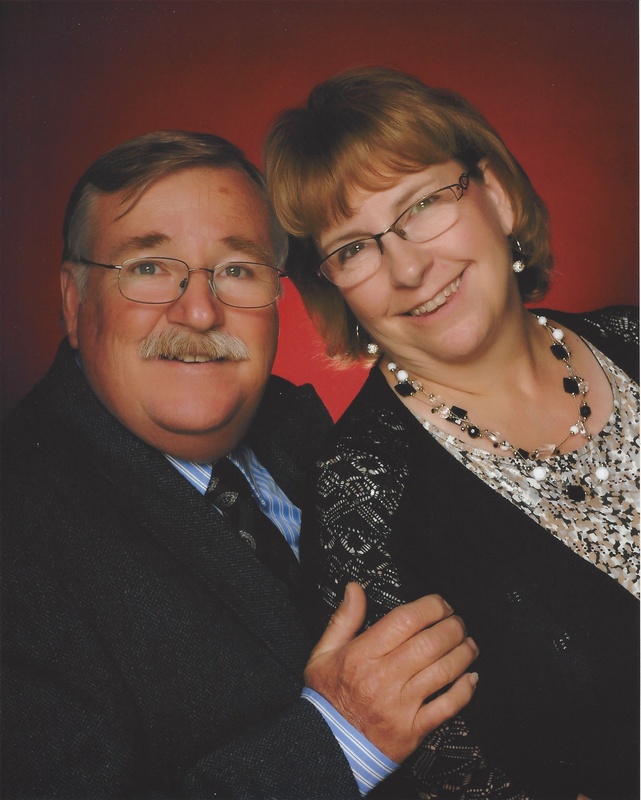 I know for this trip I was influenced by the opportunity to spend time with two great friends, Chuck and Debbie, friends that geographical distance sometimes makes our closeness difficult. 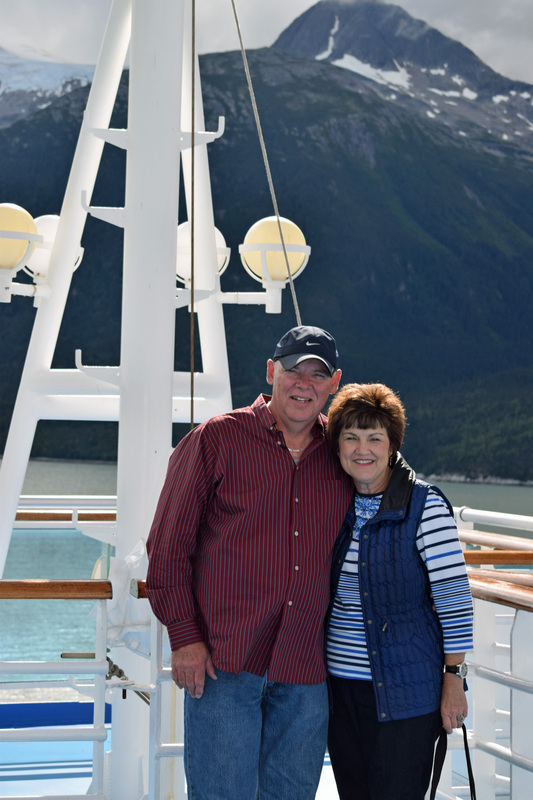 We met in Seattle, having arrived on separate flights from different states but began our cruise together in search of the beauty of Alaska and certain we would collect memories to forever cherish. 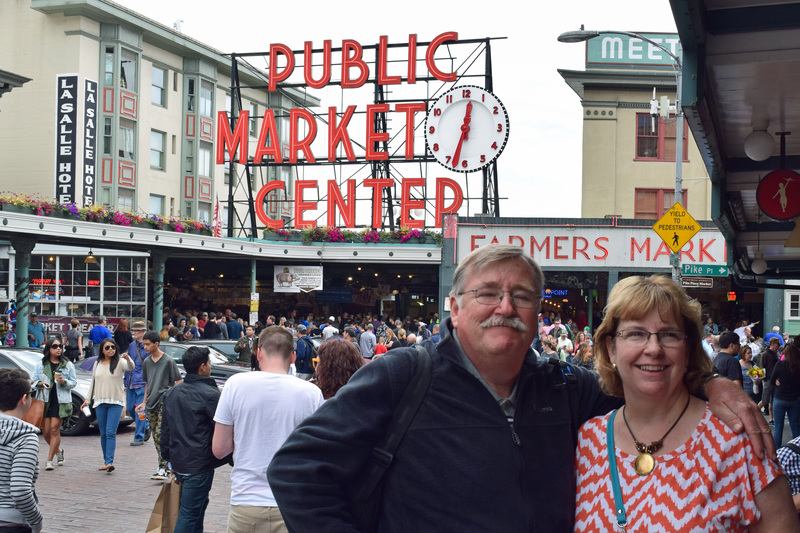 We had the opportunity to spend a little time in Seattle before we boarded the Ruby Princess. 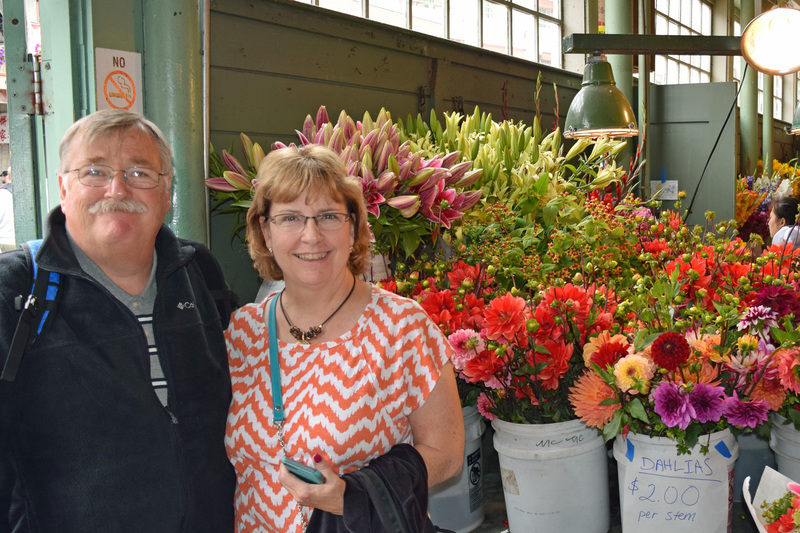 We knew visiting the Pike’s Place Market was at the top of our list, and it did not disappoint. 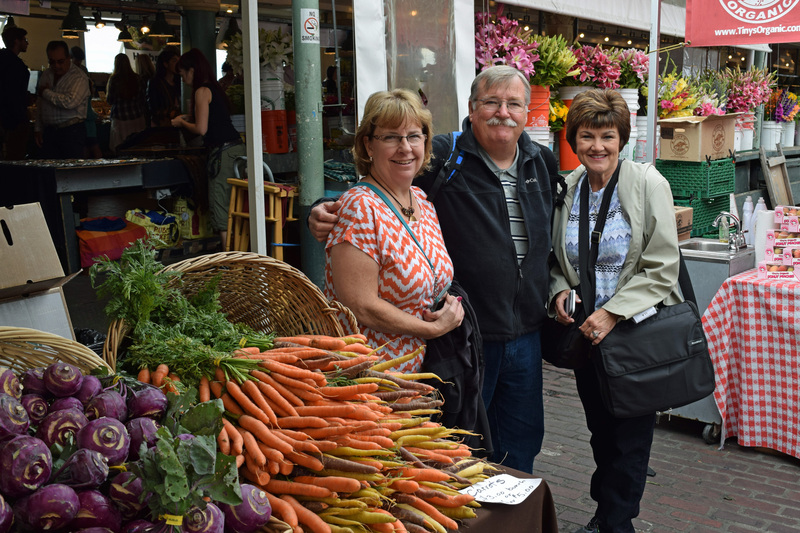 If you have never been it is actually a farmer’s market but not like the ones we have in Oklahoma or Kansas. 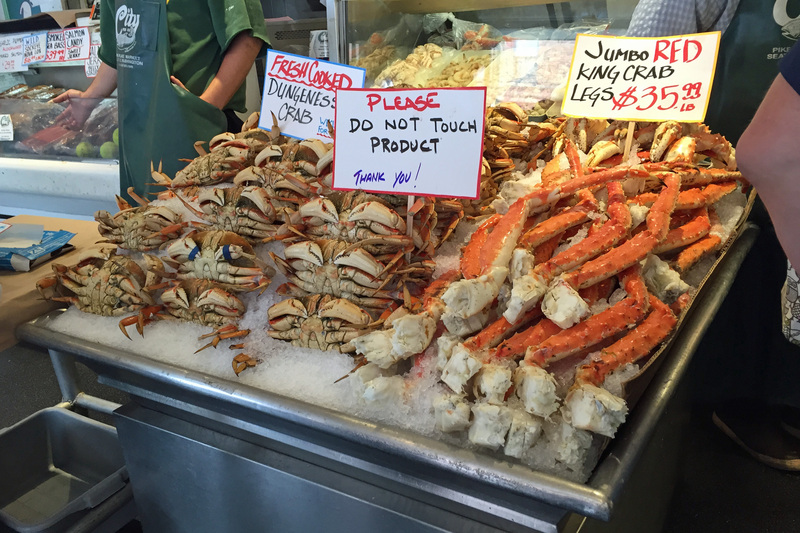 Of course seafood was the primary commodity for sale. 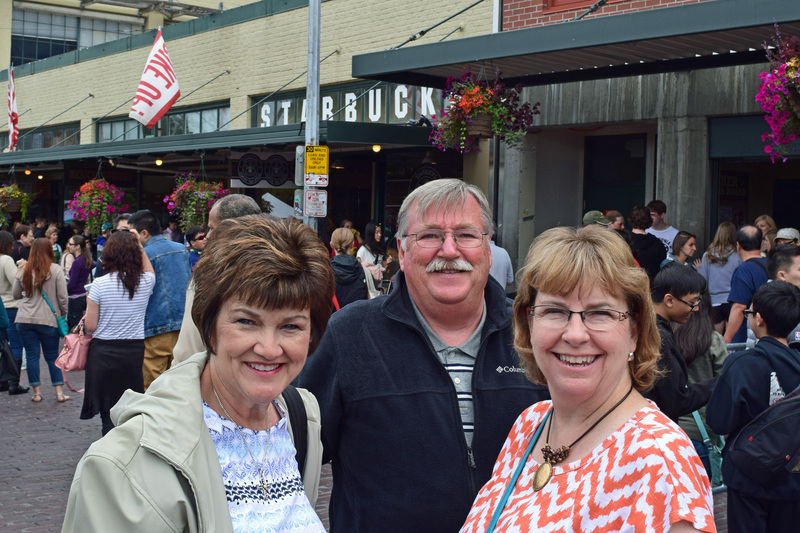 We took photos outside the first Starbucks, watched them throw fish (after much searching), shopped through hundreds of small booths, purchased beautiful bouquets of fresh flowers and thoroughly enjoyed our morning. 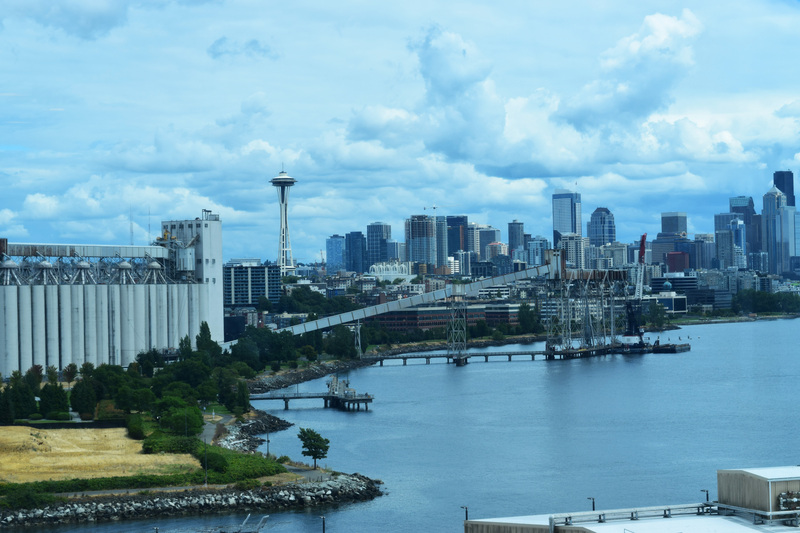 The temperature was perfect, upper 60’s, and thank you Seattle for not raining on us. 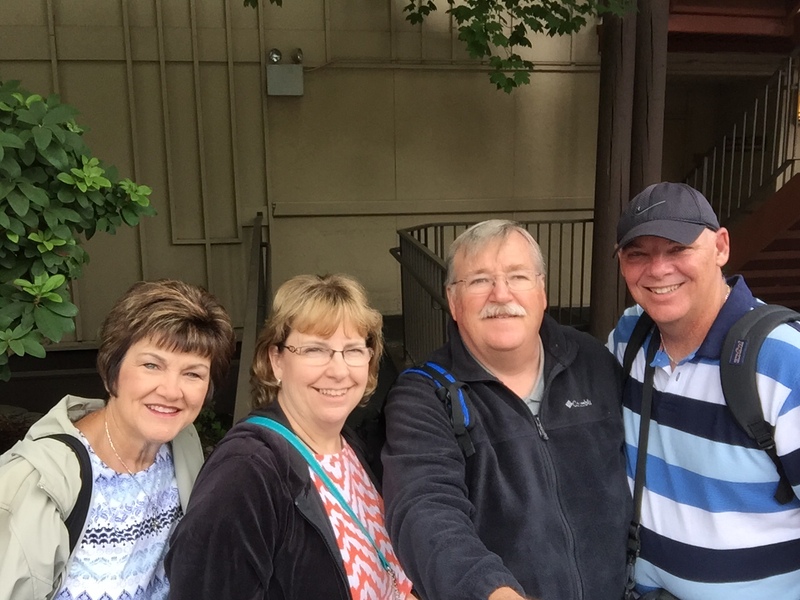 Chuck had purchased a selfie stick for our vacation and we used it many times, this was our first attempt, good job Chuck! This was taken as we went through security to board the ship. Debbie set the alarms off and was pulled aside for an individual scan, she made the cut, thank goodness. 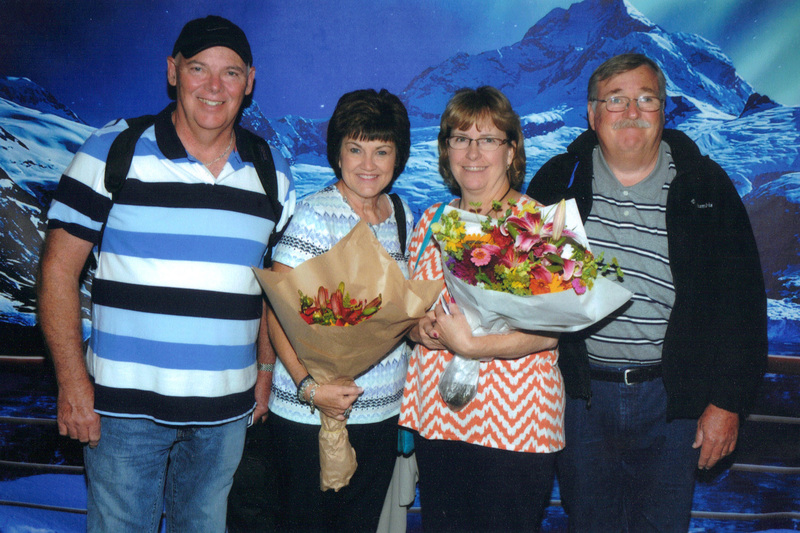 This was our very first on board photo , we had our beautiful Seattle bouquets. Please notice Chuck’s smile, Debbie had Chuck practice smiling after this. 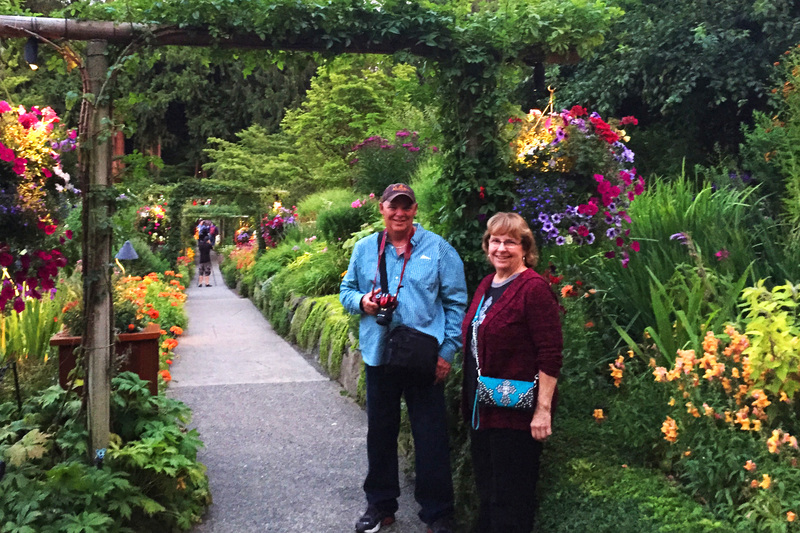 I have to say thank you Chuck and Debbie, you made me smile a million times on our trip. 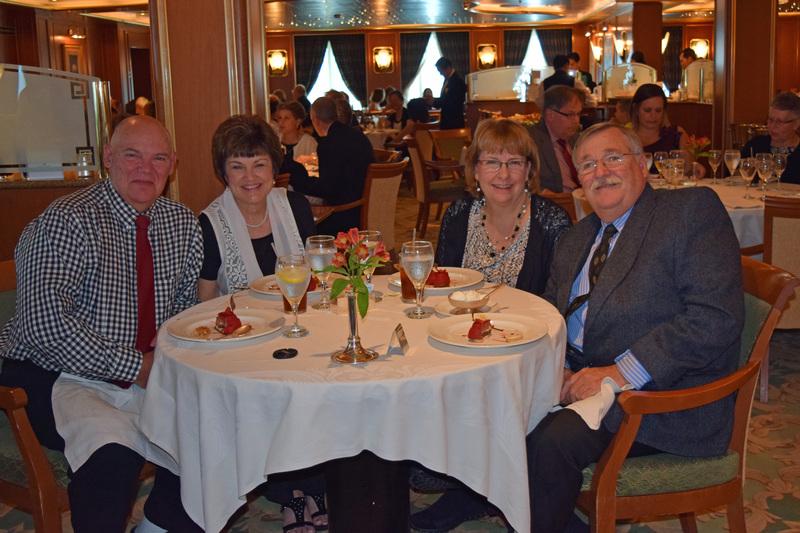 Our first night on the ship we had a wonderful dinner in a beautiful dining room. Great food, great friends and great fellowship, what more could you ask for? 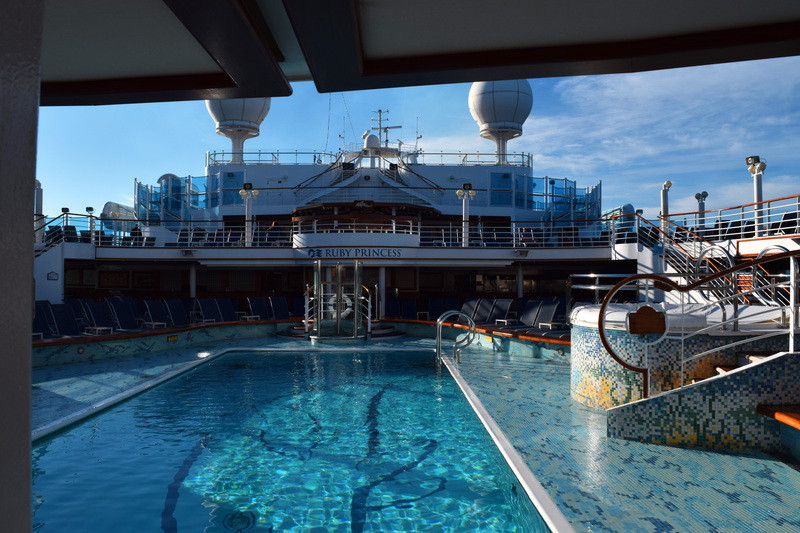 We were all ready to return to our staterooms early. 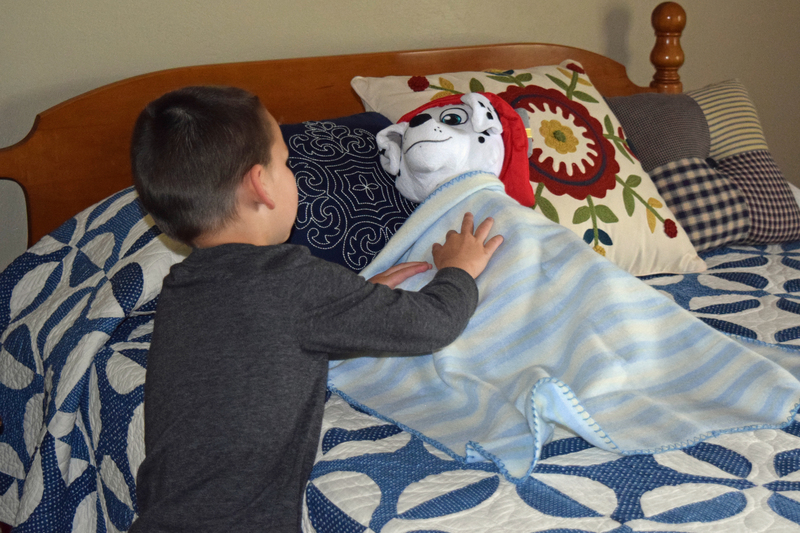 The travel day, change of time zones and anxious anticipation had left us needing rest. I think all four of us slept great, the ship seemed to just rock us to sleep. 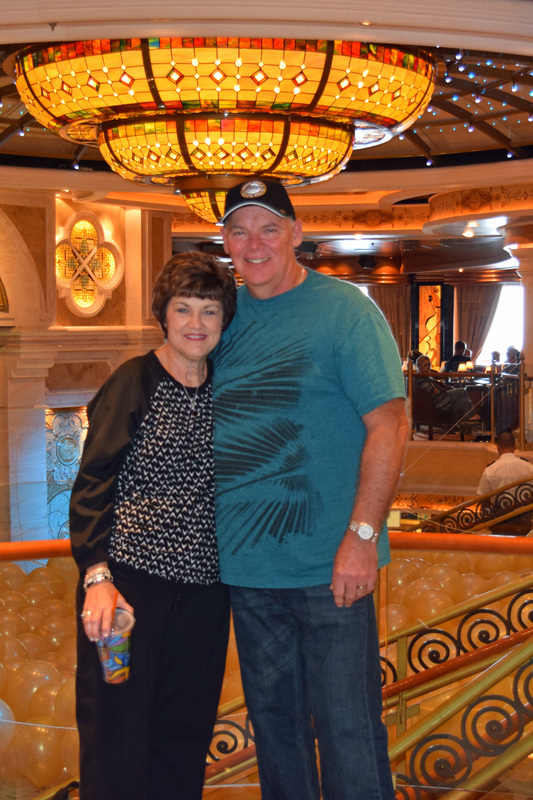 Our first full day at sea was nice but we needed to get our sea legs. Mike made use of the prescription patches for motion sickness, so happy we made that investment. At lunch time the four of us gathered at a window table on the 15th deck, we were entertained by dolphins and even some distant whales, lunch was pleasant and very relaxing. 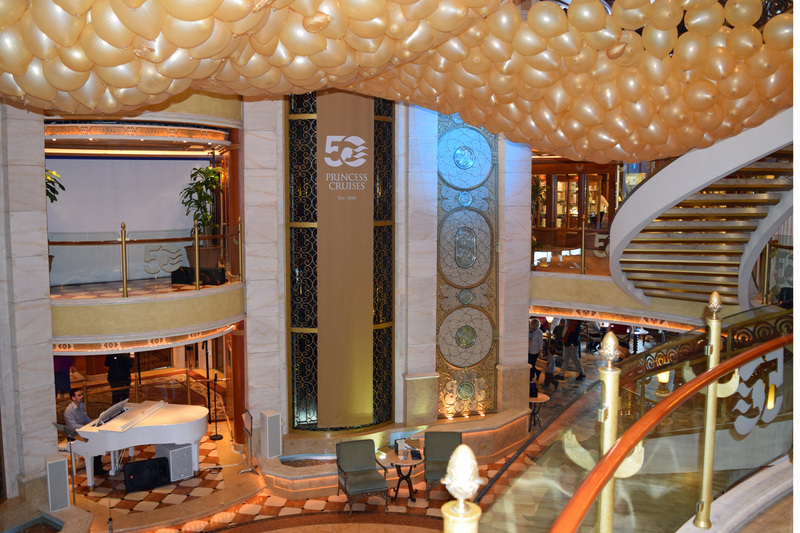 On our ship, the Ruby Princess, the full days at sea were formal nights for evening dining. I think Debbie and I both enjoyed getting to “dress up”, Chuck seemed ok with it (or pretended to), Mike not so much. He was a good sport but he much prefers his jeans and boots. We all had a good laugh when he had forgotten to pack black socks, yes, picture black dress pants, nice long sleeve shirt, tie, dress shoes and WHITE socks, still makes me smile. This was my first cruise and I learned photography sales were part of the experience. We are a photo family and I believe the photo opportunity you miss will haunt you far longer than the captured “bad hair day or ugly smile”. These were some of our purchased pics. Chuck and Debbie had really wonderful photos made Debbie had visited with one of the photographers (a young woman from South Africa) and she had recommended to us her favorite setting. We loved the pretty red back light. The meal was incredible, we took lots of pictures of the food, knowing we could never remember the names of our five course meals. Our waiter insisted we try a special drink after dinner, not knowing it was alcoholic until we had to use our ship cards for it and it arrived in shot glasses. I thought it tasted like cough syrup, but Chuck drank his quickly. I don’t know if he liked it or was just swallowing it to get it over with, but he was so funny we couldn’t quit laughing, he teased reefers might be next. I admit I had to be told what a reefer was, causing another round of laughs. Fun times! We changed back to comfy clothes and headed to our first show, called Stardust. It was singing and dancing and nice entertainment. 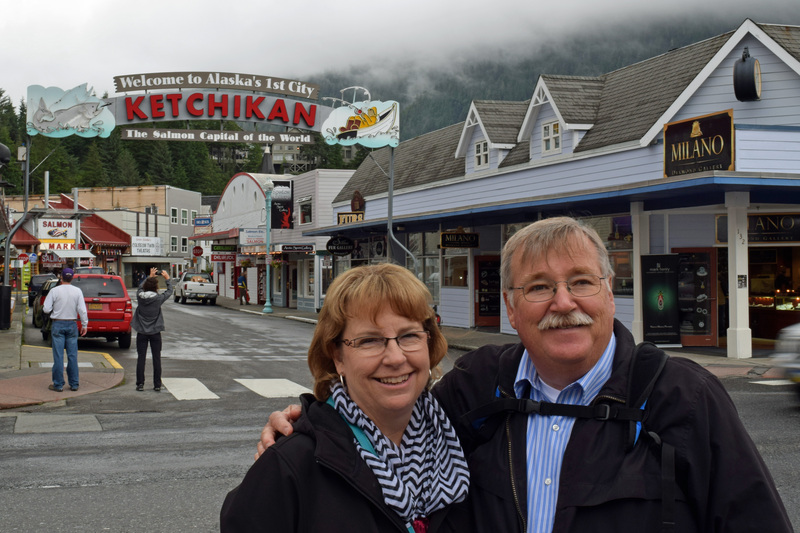 Knowing Ketchikan was an early port (6:30 a.m.) we called it a night. 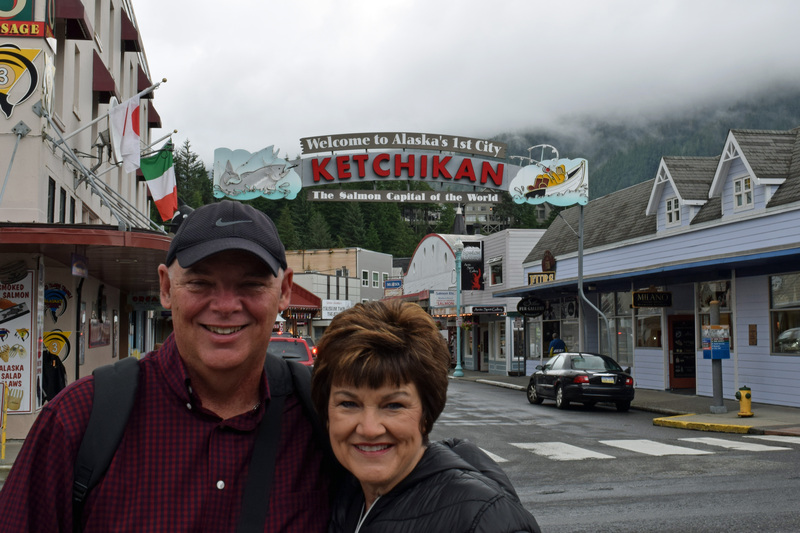 Our first port was Ketchikan, yea for land again. 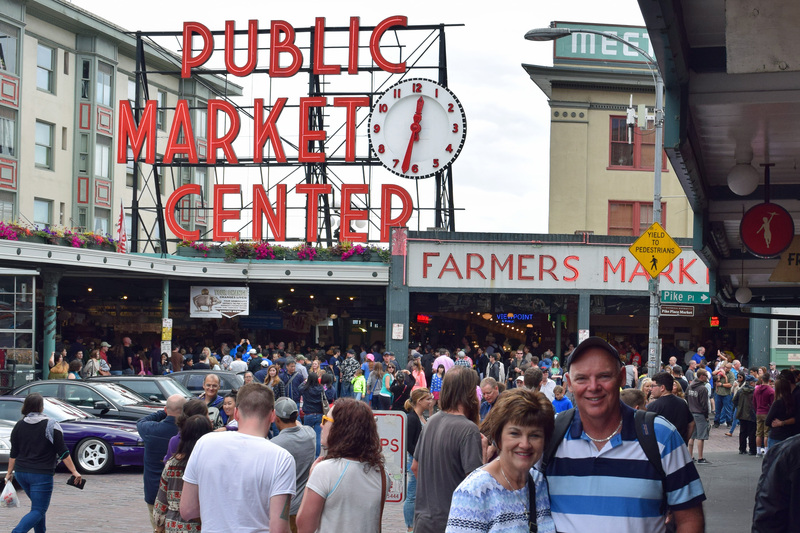 The first thing Debbie and I did upon stepping foot on U.S. soil was reconnect with the electronic world. 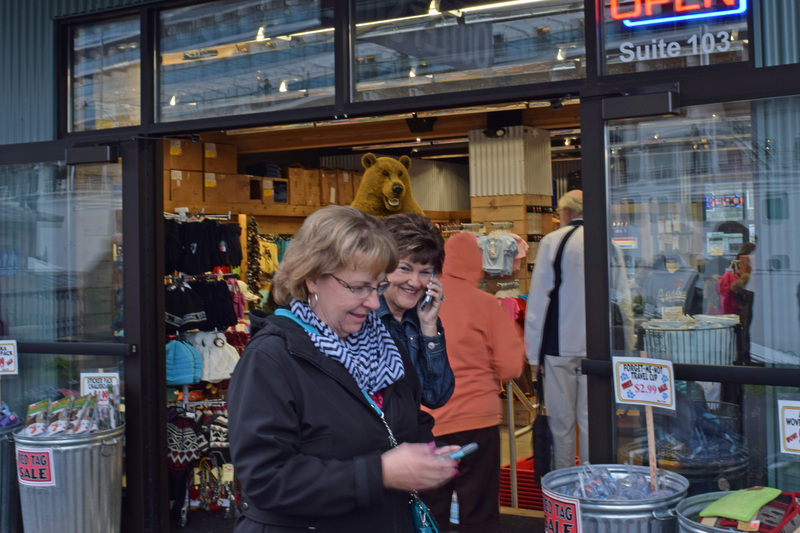 Ketchikan gave us great cell phone service, we received all our texts, emails and phone calls, I even glanced at Facebook. I called all three of my children, I know it had only been a few days but I needed to hear their voices and know all were fine. 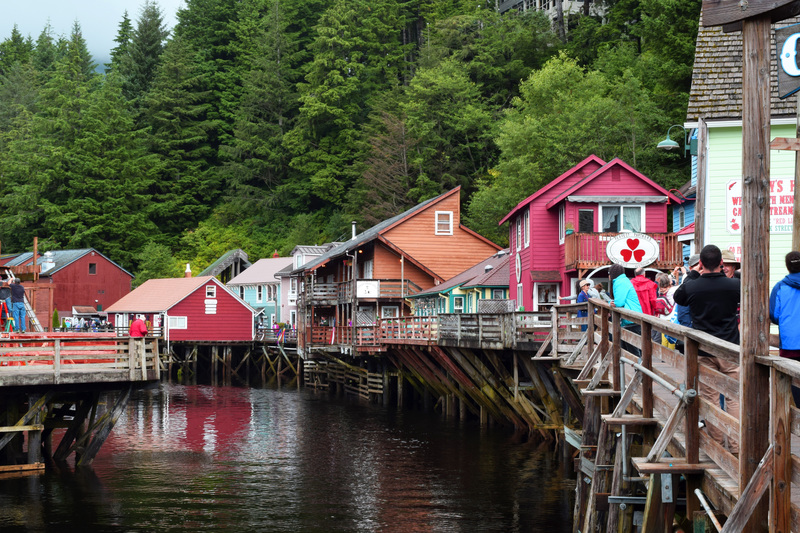 Ketchikan was a fun port, easily within walking distance of our ship. We explored on our own for quite a while, the shop owners were friendly and eager to help us. 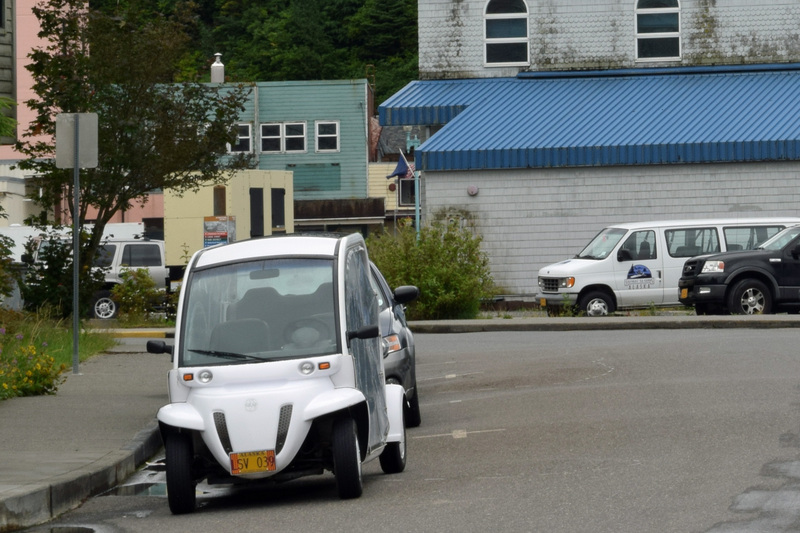 We happened upon some little cars, they were similar to a golf cart and available to rent. I suggested we make use of one and in moments we were off. 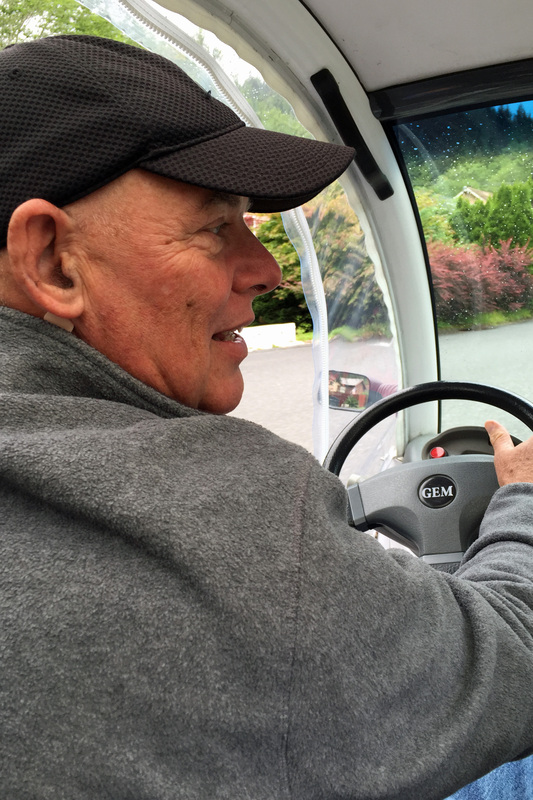 Mike was our driver, Chuck our navigator, (Debbie assisted). I was designated as the liaison with our “guide” who had remained at the rental store, he could never have fit in our little car. My actual job was to call the “guide” when we were lost, this happened multiple times. 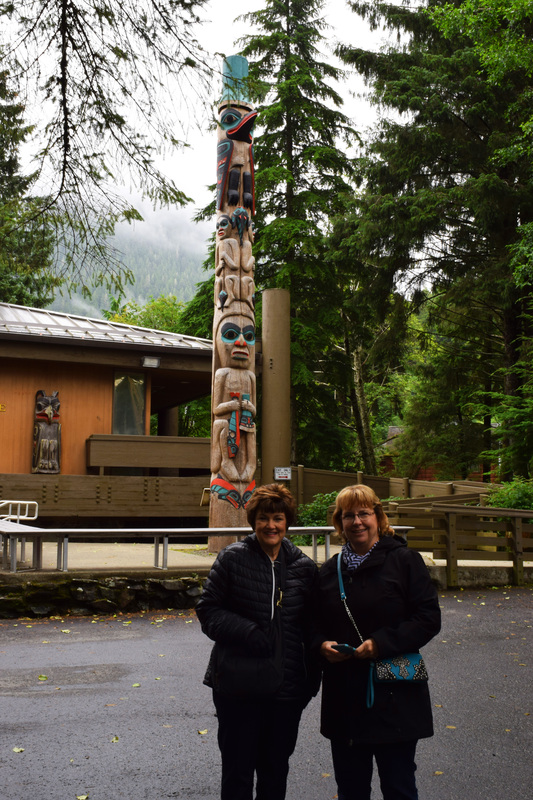 We had a fun adventure, we saw a beautiful city, complete with totem poles, the original historic downtown Ketchikan, and I think our favorite, the salmon. Their task of swimming upstream seemed impossible but yet they succeed. They were king salmon, unbelievable numbers of them and they seemed extremely large, and I am not telling a fish story. 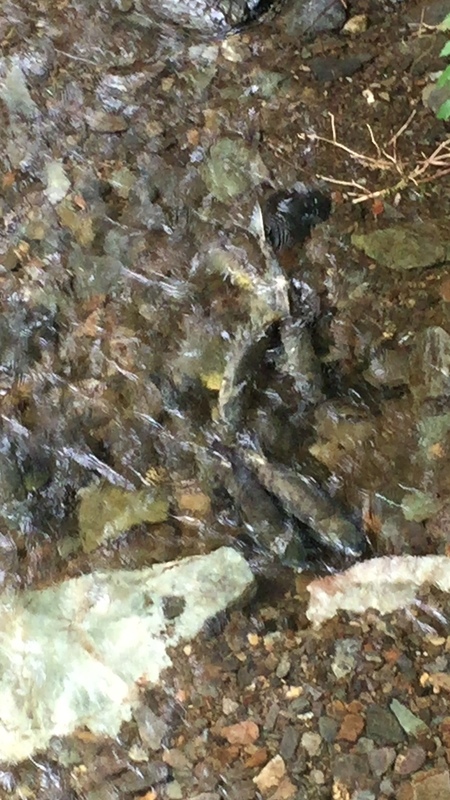 Debbie took a great salmon video I tried to share but I am simply not tech savvy enough to make it happen. 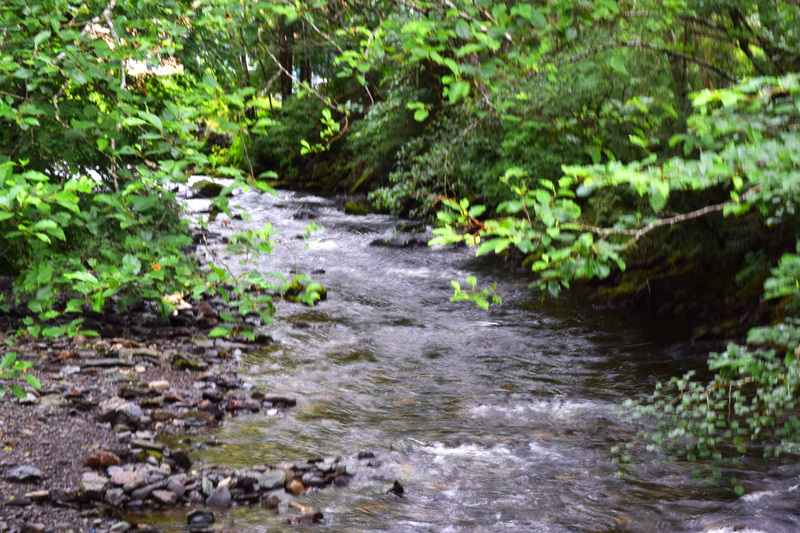 All the salmon swimming photos are blurry because the salmon are always moving, you would think they would be exhausted. Mike took lots of Ketchikan pictures, here are a few. 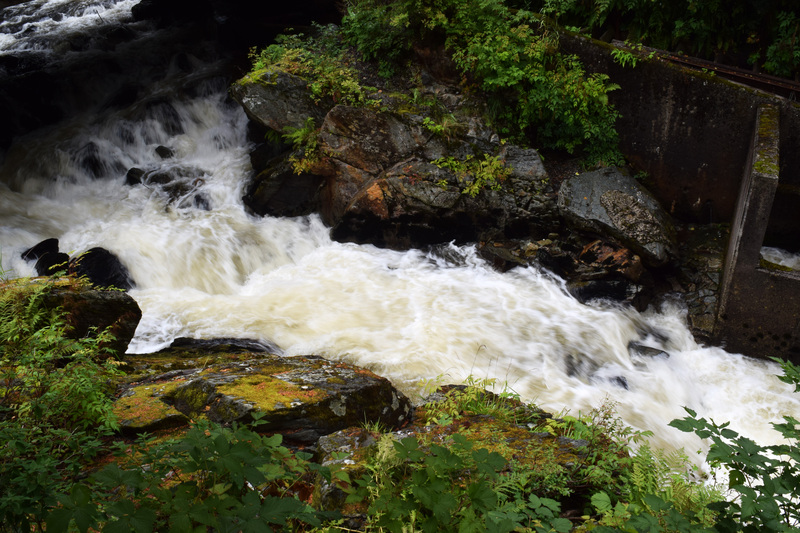 Having been informed that Ketchikan has rain 365 days a year and that they measure rainfall in feet, not inches, we felt so blessed that a few sprinkles are all we had on our excursion. After a day on land we returned to the ship for another enjoyable evening. 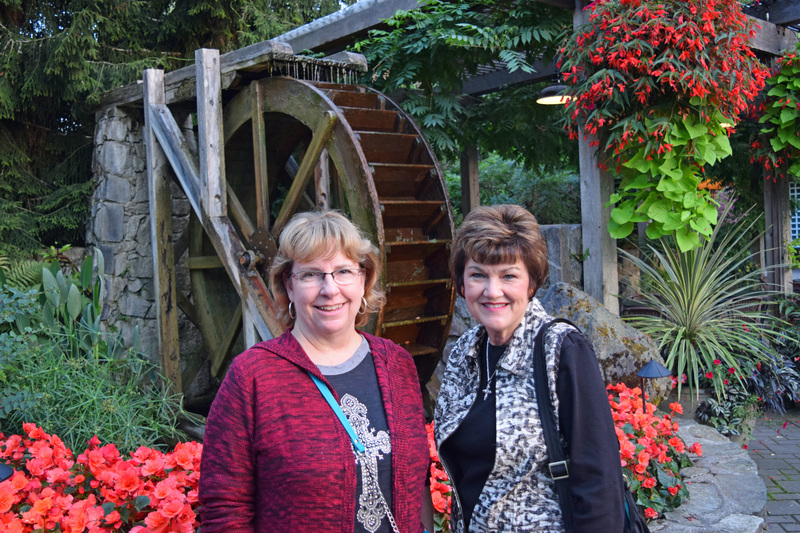 Debbie and I attended a scrapbook journaling class, turned out we knew more than the instructor. Her advice after handing us a cruise themed scrapbook package was, and I quote, “there are samples in the package or be creative”. End of instruction. 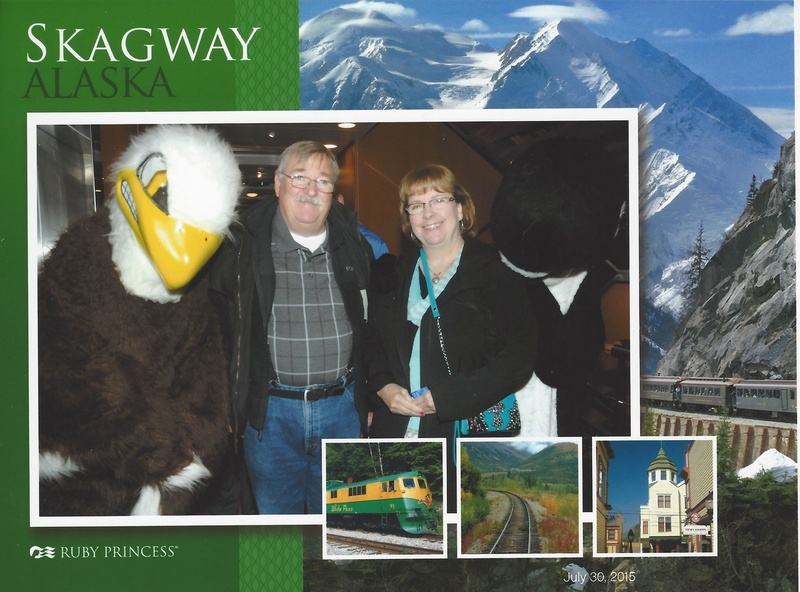 We were grateful for the fun kit, having already purchased the Alaska scrapbook and accessory package when we bought our first cruise photo. What can I say, we are both crafters at heart. 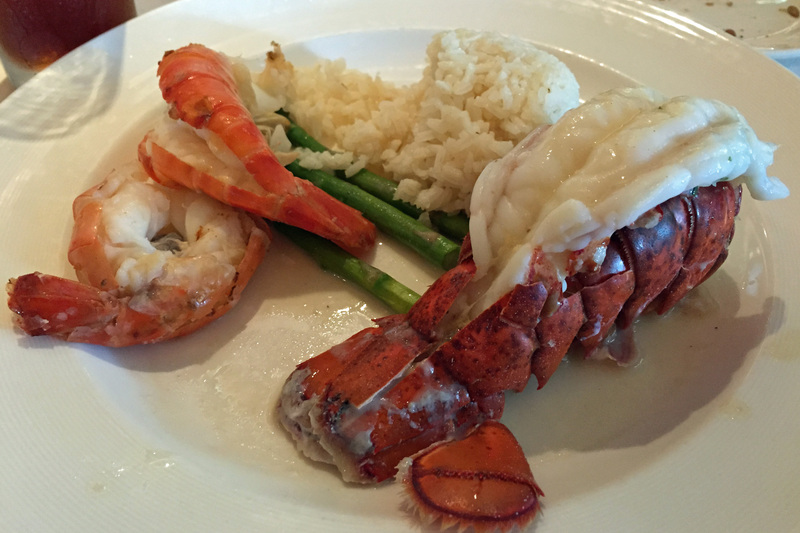 Dinner was great, we had grown fond of our waiters, they were friendly and trying to get to know us. 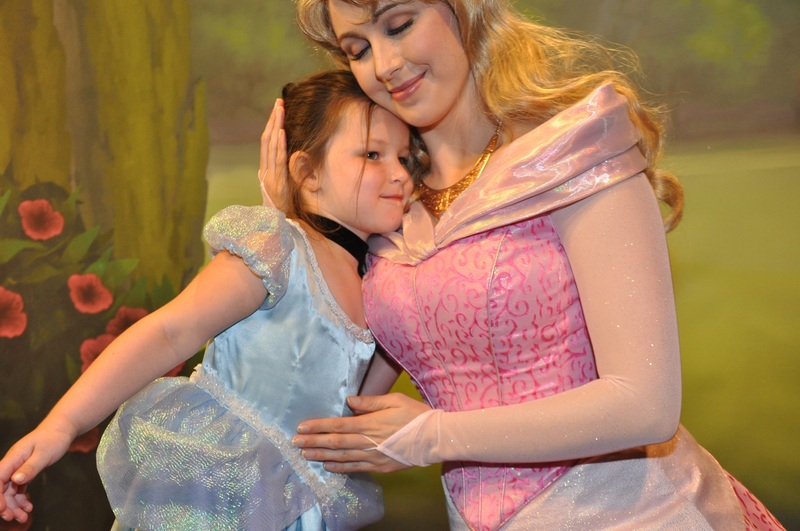 We took in a show called Once Upon a Dream, another fun production. This day had started very early but another time change had worked to our advantage. 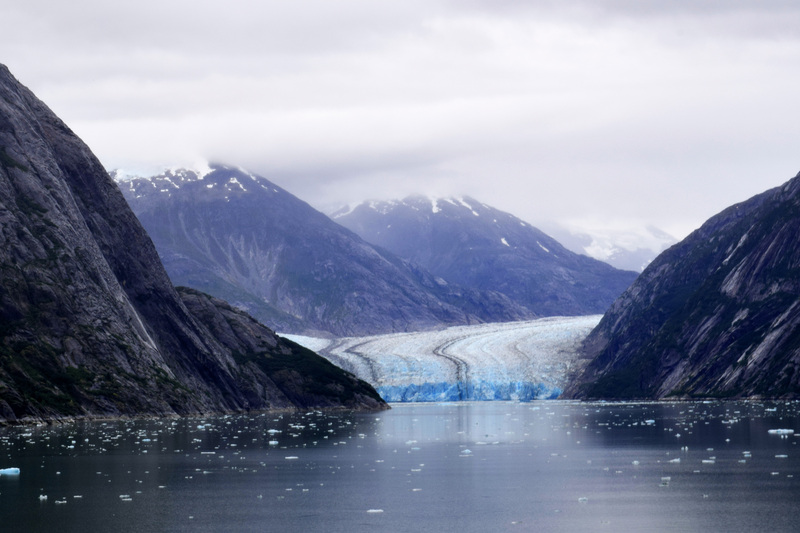 Our next day was to begin even earlier, we were to travel through the Tracy Arm Fjord, beginning at 5:00 a.m., an incredibly majestic passageway. Mike, Debbie and Chuck knew they didn’t want to miss anything so they planned on an early morning, they would breakfast on the 15th deck with a spectacular window table, and take advantage of every photo opportunity. I joined them eventually, I felt reasonably sure our stateroom’s balcony offered quite a nice view. 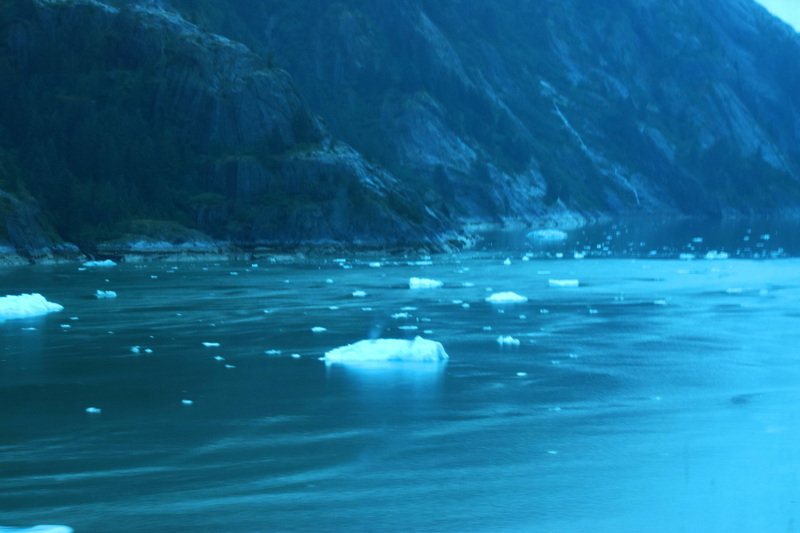 Mike was the earliest to arrive to the photo-fest and was the first to learn an iceberg had blocked the entrance to Tracy Arm. 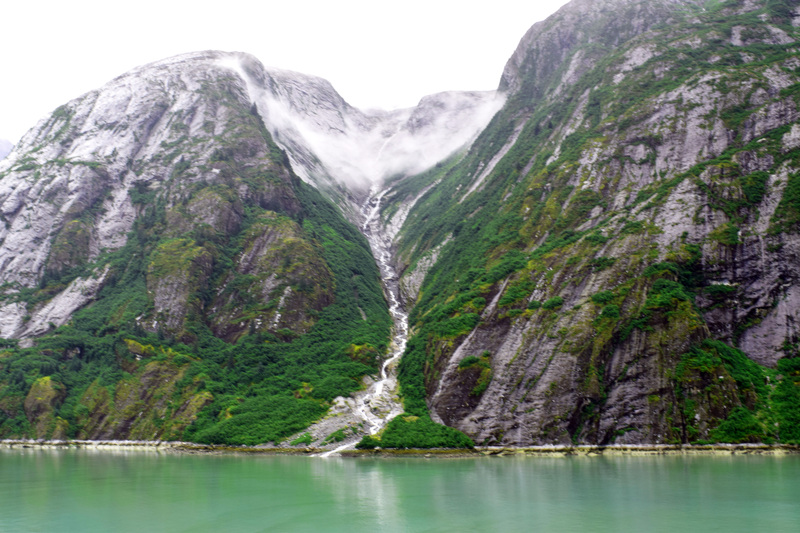 Our capable crew had received special permission to enter Endicott Arm, another beautiful fjord. 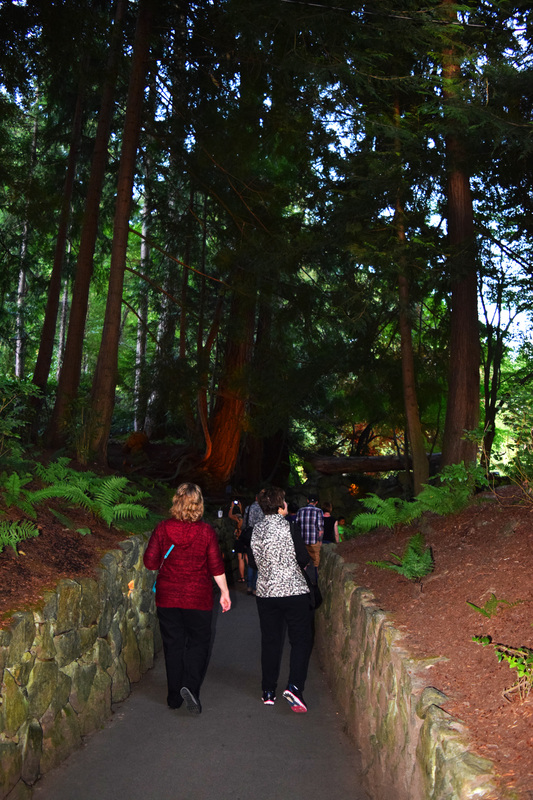 In this passageway we had an incredible view of Dawes Glacier, check out this photo. After experiencing the Endicott Arm I feel the need for new adjectives, beautiful and majestic are not adequate. 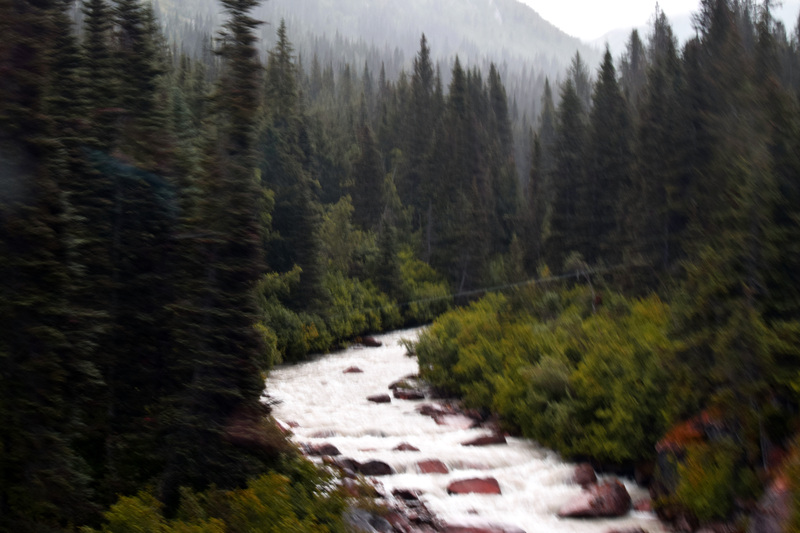 I see and feel God in my life everyday but witnessing His Alaskan canvas was beyond inspiring. these are a few examples, . 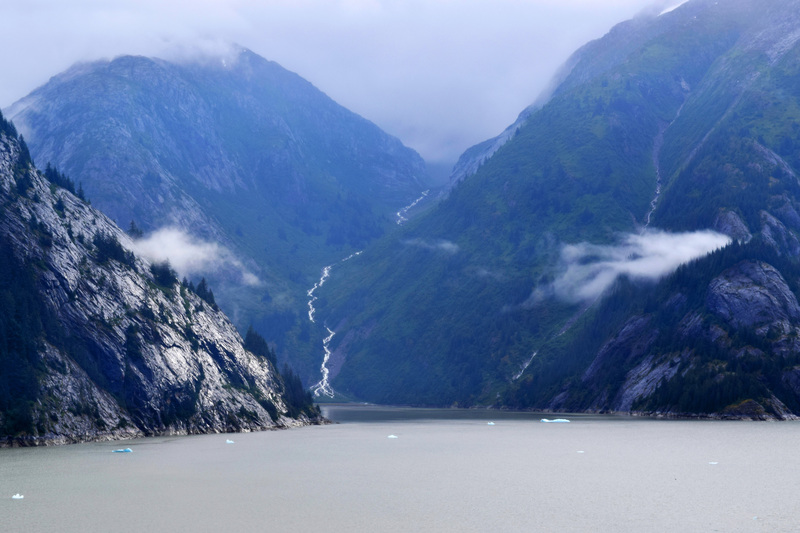 That same morning after leaving the Fjord we set sail for Juneau, Alaska’s capital. An announcement from one of the bridge officers informed everyone to look port side, a large pod of humpback whales had been sighted. 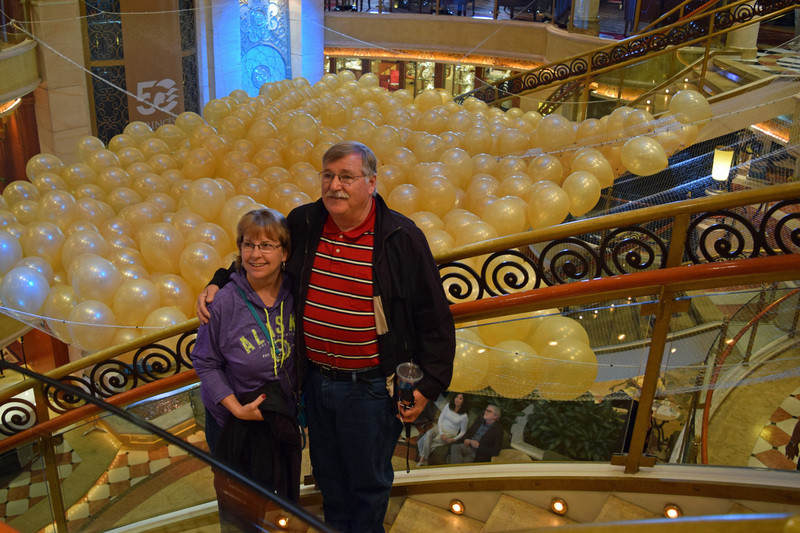 Our stateroom was port side and we were thankful for the millionth time for our balcony. It was difficult to catch a photo of one of the whales but incredible to watch, (I know I have greatly overused the “incredible ” word, please forgive me). 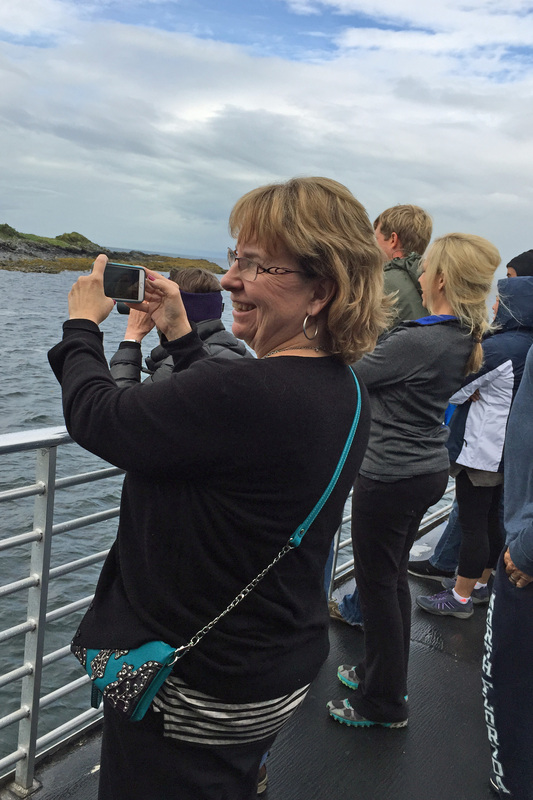 We had booked an afternoon excursion entitled the Whale Watching and Wildlife Quest. Shortly after docking in Juneau we caught a bus to board another much smaller vessel, actually a catamaran. 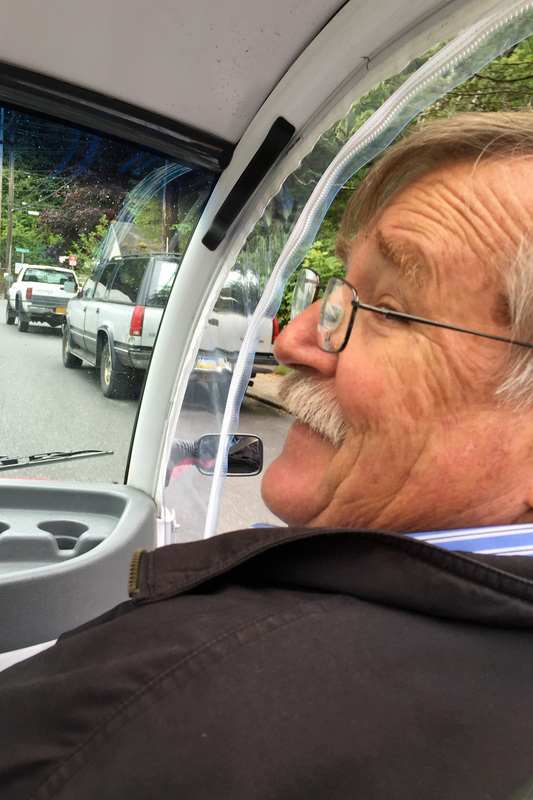 Our bus driver was a fun young woman filled with Juneau facts and trivia and eager to share. I want to share what I thought were the most interesting. 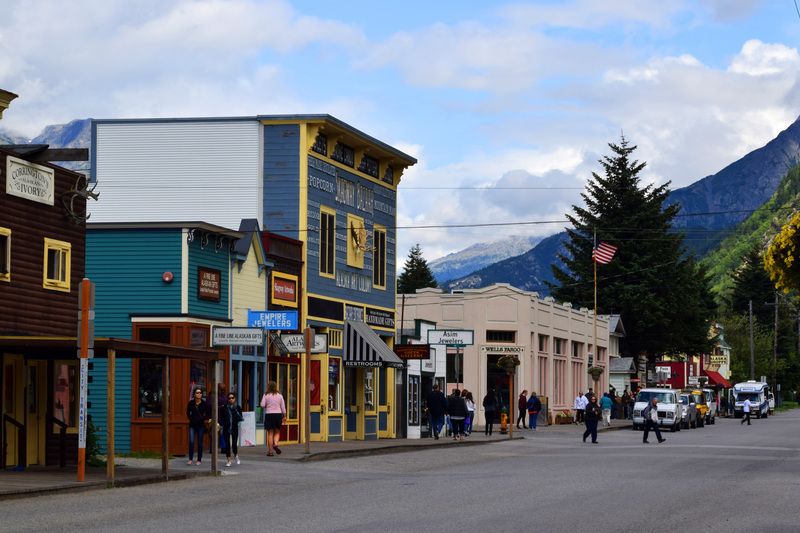 Yearly, Juneau gets 100″ of snow and 90″ of rain, of the 700,000 total population of Alaska 33,000 live in Juneau. 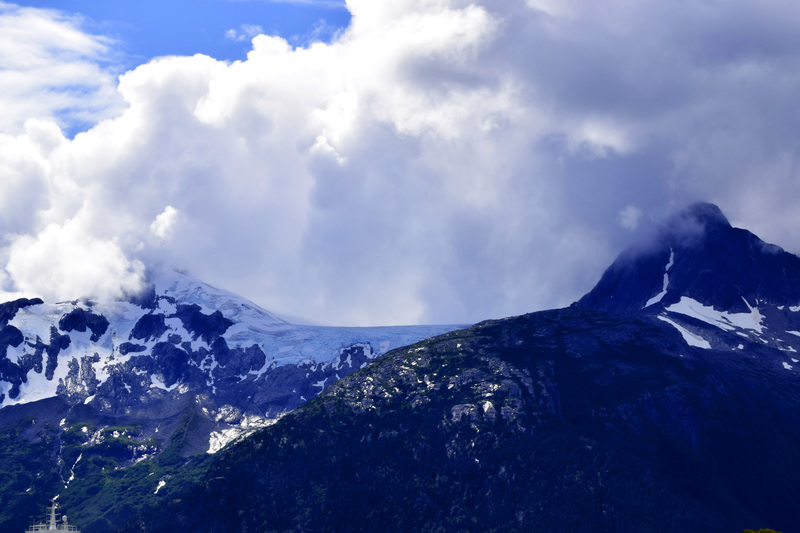 Mendenhall Glacier is home to Juneau, we did not get to do the excursion there but just the view of it from our bus made me add it to my list for next time. She explained the top 3 jobs in Alaska, 1) Government, 2) Tourism (no surprise), and 3) Fishing. She shared that the U.S. purchased Alaska in 1867 from Russia for less than 2 cents an acre at a total price of 7.2 million dollars. 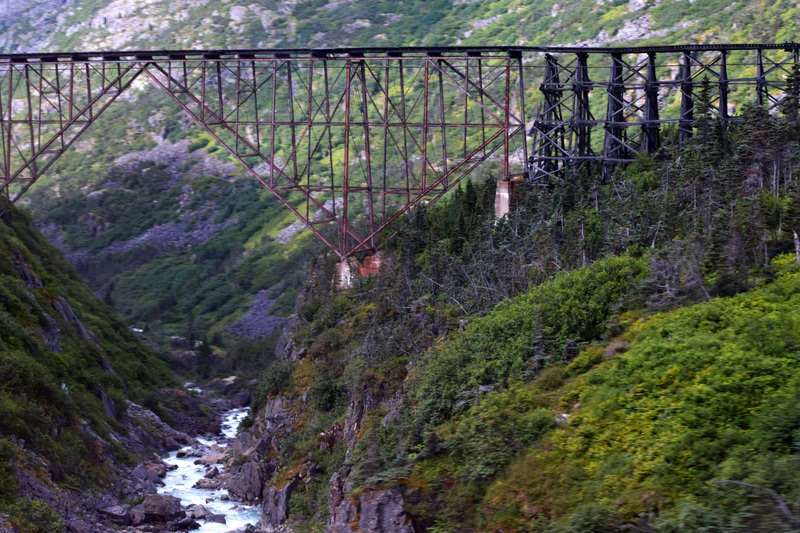 Only 13 years later gold was discovered in Alaska. She explained the average income in Juneau was $80,000 and the average home costs $350,000 to $400,000. Lastly there is only one fast food restaurant in Juneau, and I bet everyone can guess which one, burgers and fries under the Golden Arches is right. 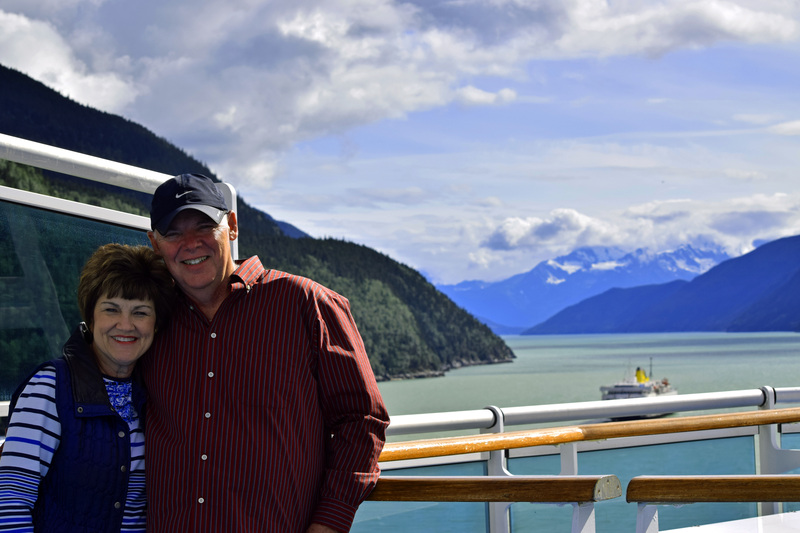 Debbie and I were both nervous about our Juneau excursion, I feared the smaller boat would be cold, wet, uncomfortable and a recipe for sea sickness. Nothing could have been farther from the truth. The bus ride was in continuous rain but upon arriving to board our excursion boat we found it very nice. The seats were soft and comfy, there were super clean restrooms and a well stocked refreshment bar complete with snacks and diet Dr. Pepper and ice, it was warm and the crew was friendly and informative. Our captain took us many miles into the sea and had what seemed like a magic whale locator. 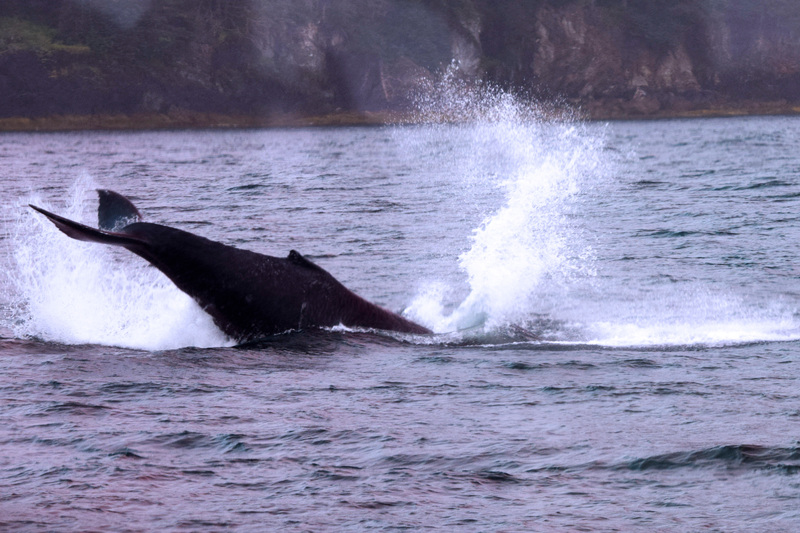 We enjoyed multiple sightings of Humpback whales, even a calf and mother. The calf seemed to want to entertain us and waved again and again with his tail. The calf seemed huge until the mother showed herself and then we found out what huge really was. 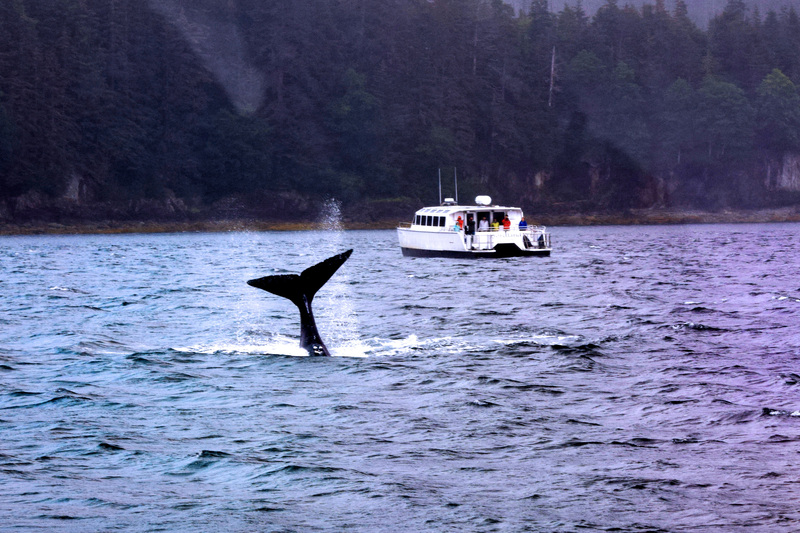 Our excursion came with a guarantee, if you did not see a whale they would give you $100.00 as you exited the boat. We learned they had never had to refund a single penny. 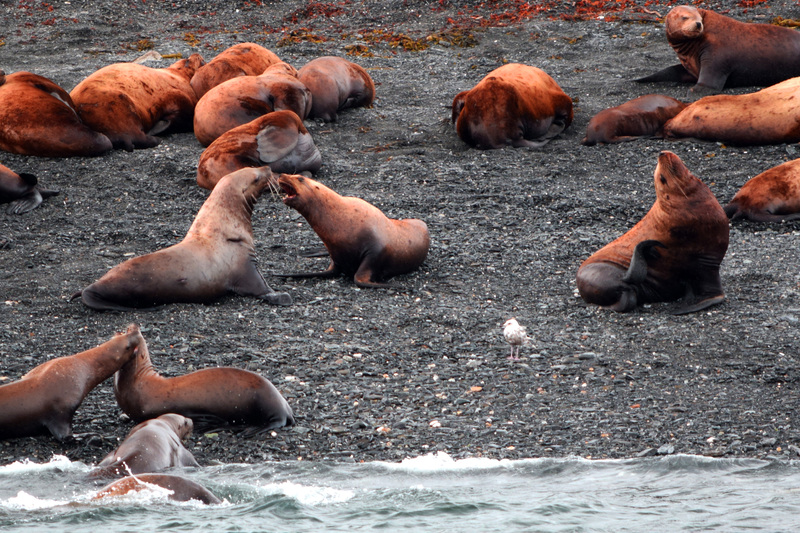 After the whale show the captain headed to a small island and to our amazement we photographed, watched and listened to hundreds of sea lions. I grabbed a couple of pics of Mike and Debbie in action Whale watching was such an awesome experience, and one I would highly recommend. We finished our day in Juneau with a little shopping, this was our first port to truly rain most of the day but it did not dampen our spirits. 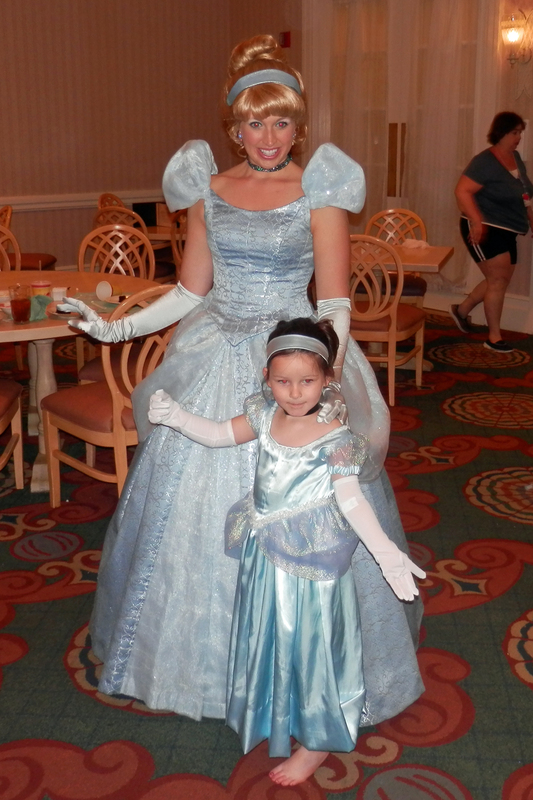 Later back on ship we tried a different dining room and although still delicious we missed our familiar wait staff. 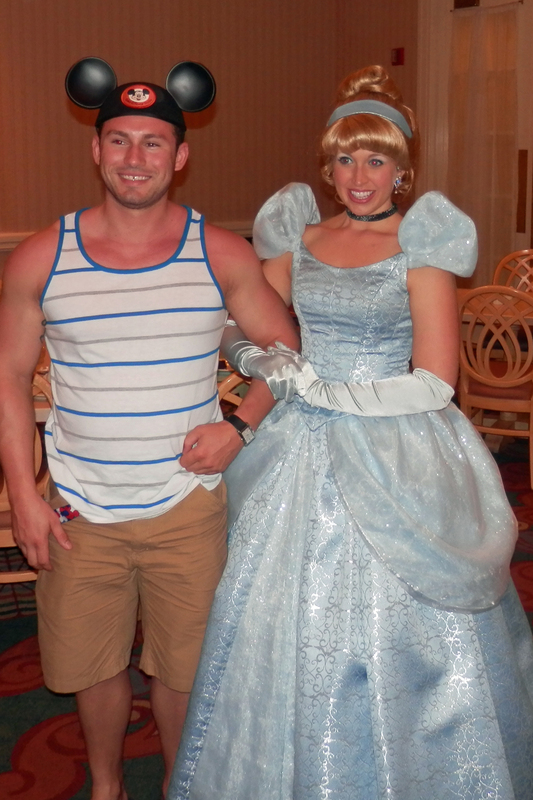 Mike and I finished our night with a movie, “Cinderella” was playing and we totally loved it. 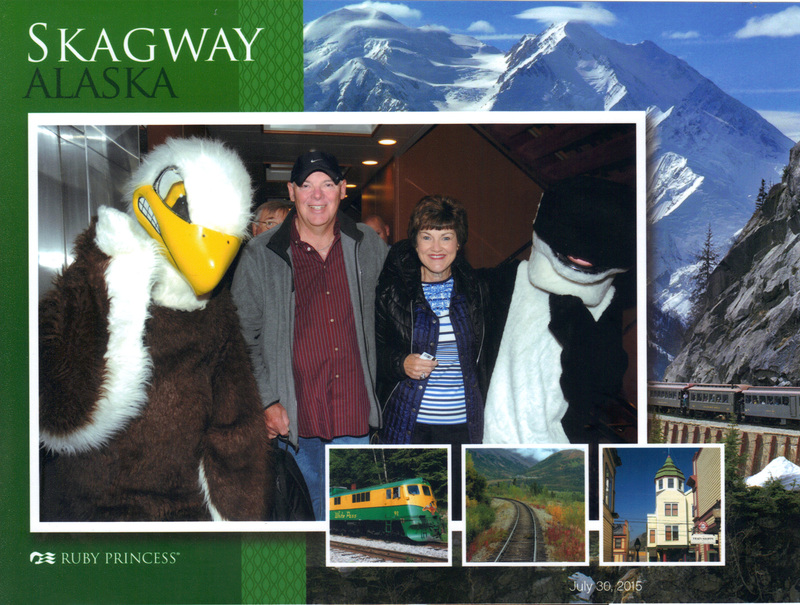 In Skagway our excursion was a train ride called White Pass Scenic Journey, it was in the largest national rain forest in North America. It was almost a 3,000 foot climb in just 20 miles. Shortly after you boarded the train you learned the railway was constructed in 1898 and in just a few more minutes you understood the steep grades and tight curves you were about to experience. 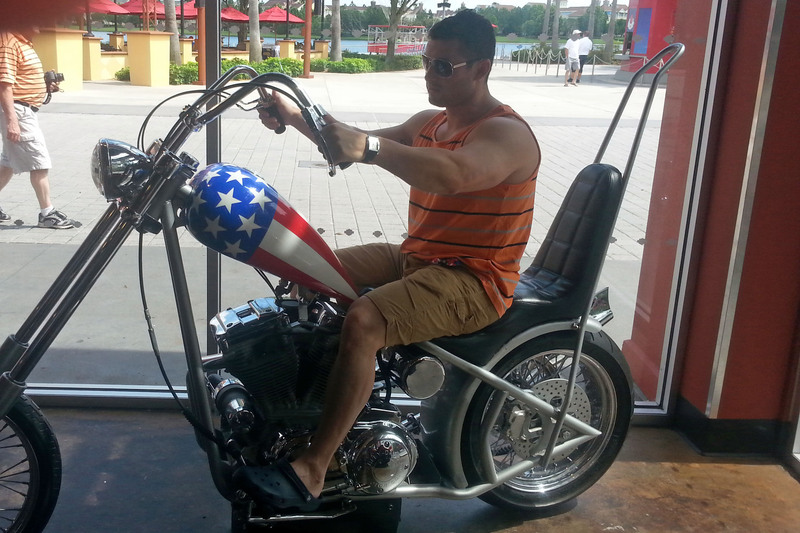 I was nervous as the ride began and glad I was sitting on the interior mountain hugging side. Our guide was quick to inform us that when we reached the very top all passengers would switch sides and then we would get the “good” seats, oh happy day. I eventually relaxed, or maybe just made peace with the situation. Maybe it was Debbie’s words of encouragement, she said, “if something happens it will be so fast we won’t know it and then we will all wake up in a better place”. The photo opportunities were endless, here are a few. 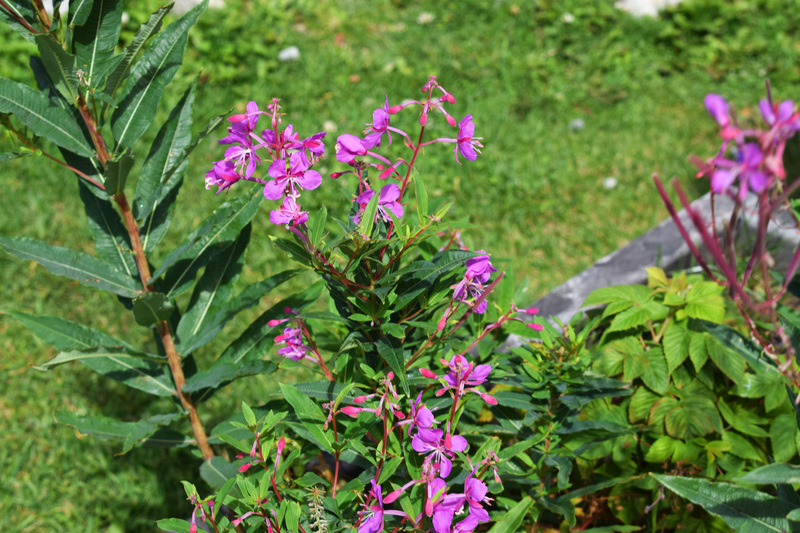 There were pretty pink flowers all over the mountain, their name was fireweed. They earned their name by always being the first thing to bloom after a fire had ravaged the land. Fireweed bloomed from the ground up then finally turned to a dandelion like cotton. 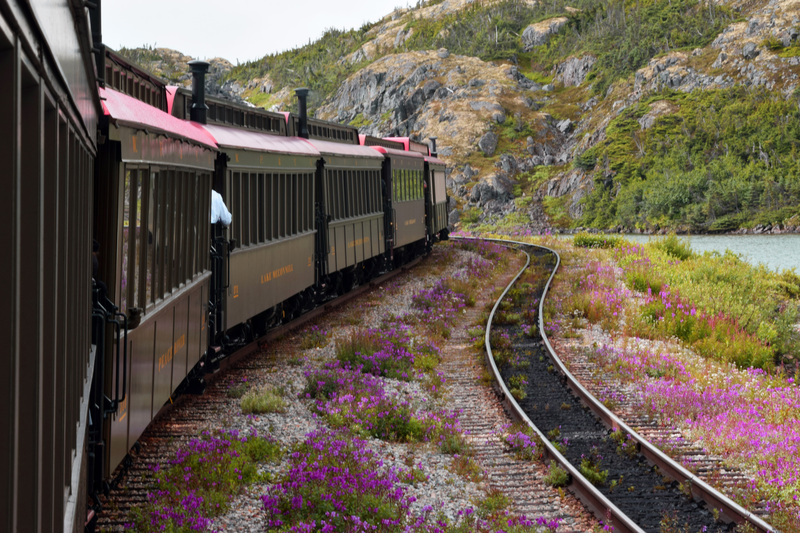 In Skagway the saying is, “when the fireweed turns to cotton, summer is soon forgotten” and snow is only six weeks away. 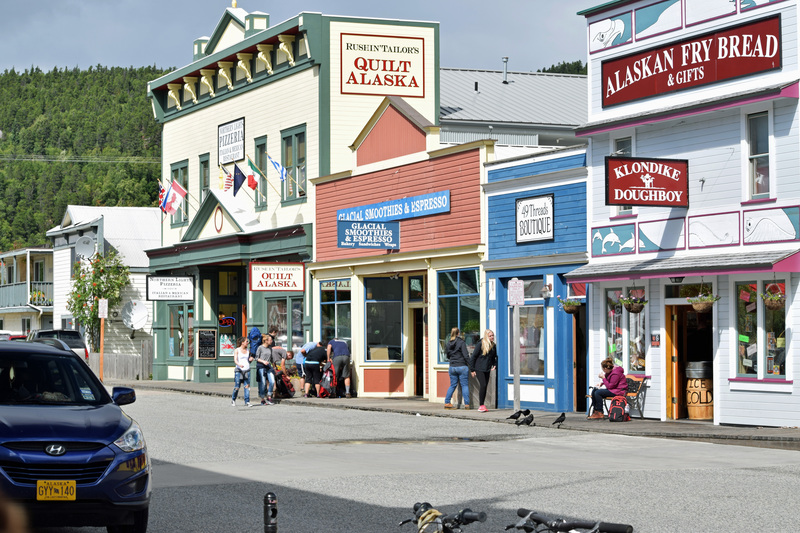 Of course we shopped the quaint little city of Skagway, and I do mean little, it is home to only 986 year-round residents. 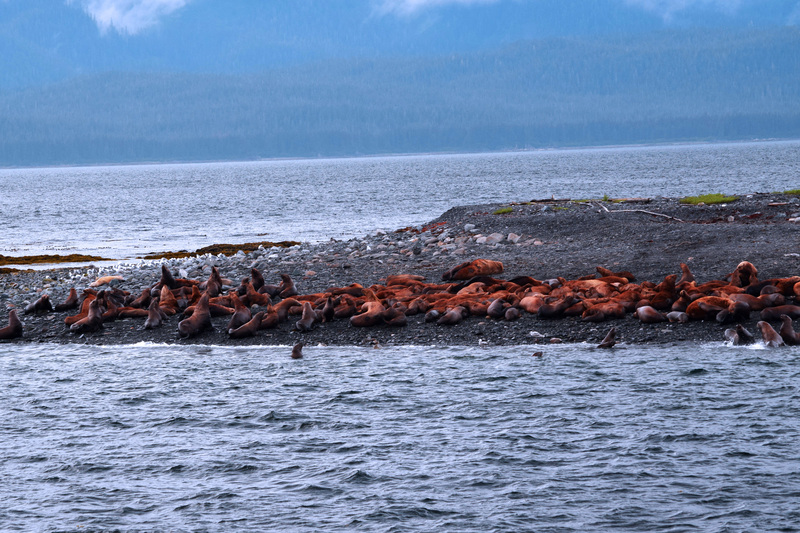 That population grows to 2,500 for the summer and as many as 10,000 tourists daily from early May to late September. 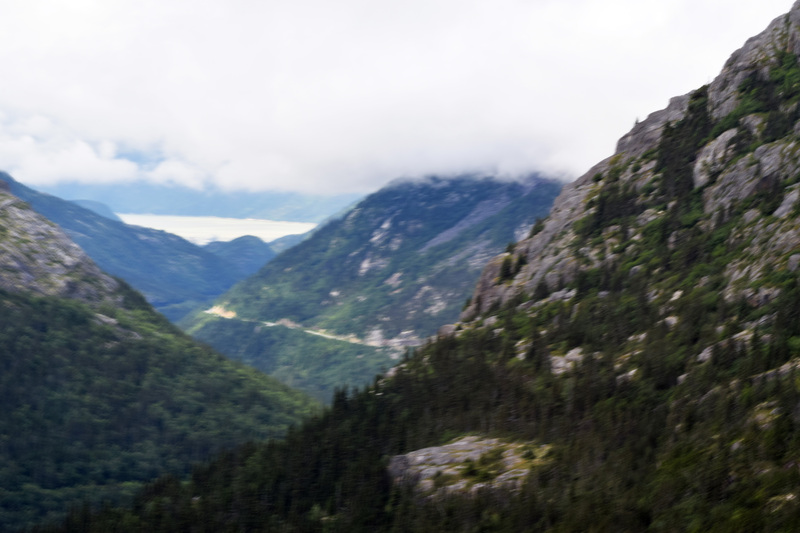 We all loved the view of Harding Glacier Skagway offered, it was like a beautiful blue flat mountain of ice, Mike tried to capture a picture. 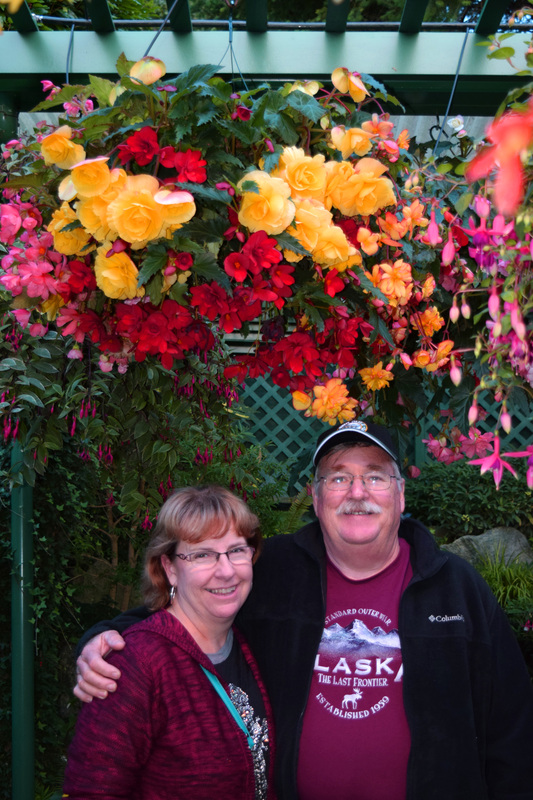 After our day at Skagway we had a few hours to explore the ship and grabbed a few shots with amazing backgrounds . 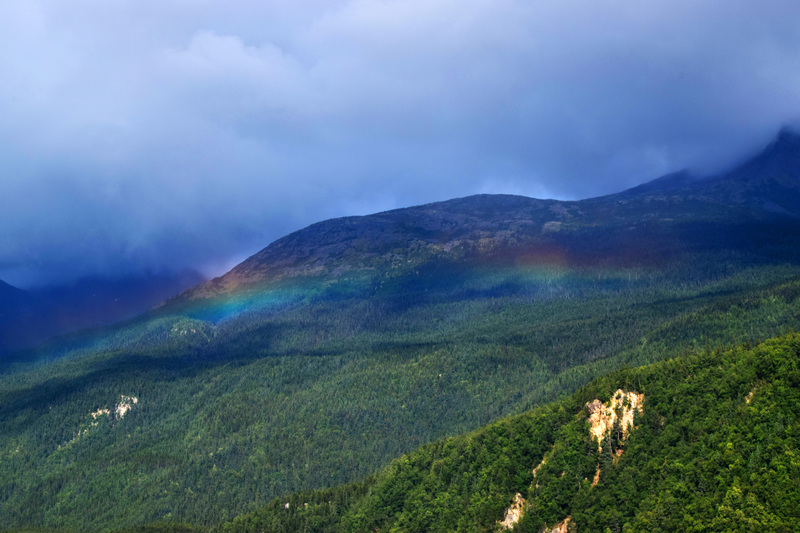 Our balcony view that same afternoon was of a rainbow on the mountainside , I am still amazed by the beauty. 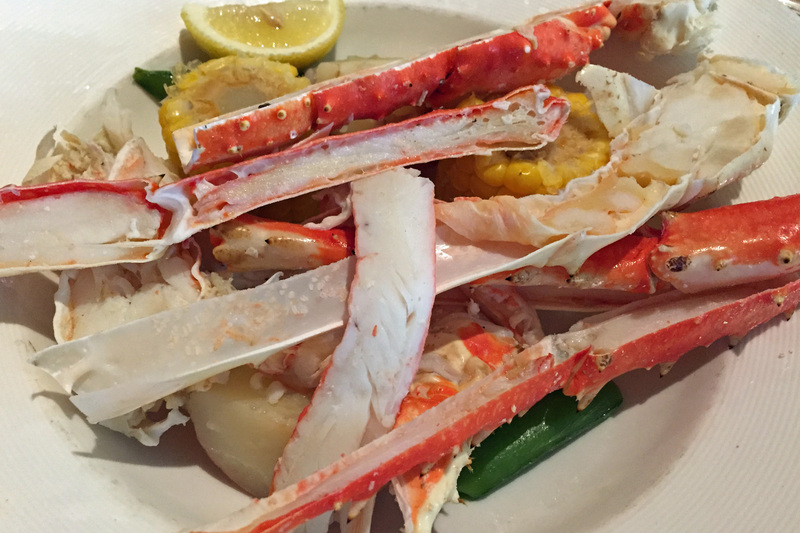 Our evening meal was grand as always, with king crab on the menu. Chuck had been looking forward to the crab and it was delicious. After dinner we were entertained by Ben Seidman, a comedic magician. All four of us agreed he was very talented. 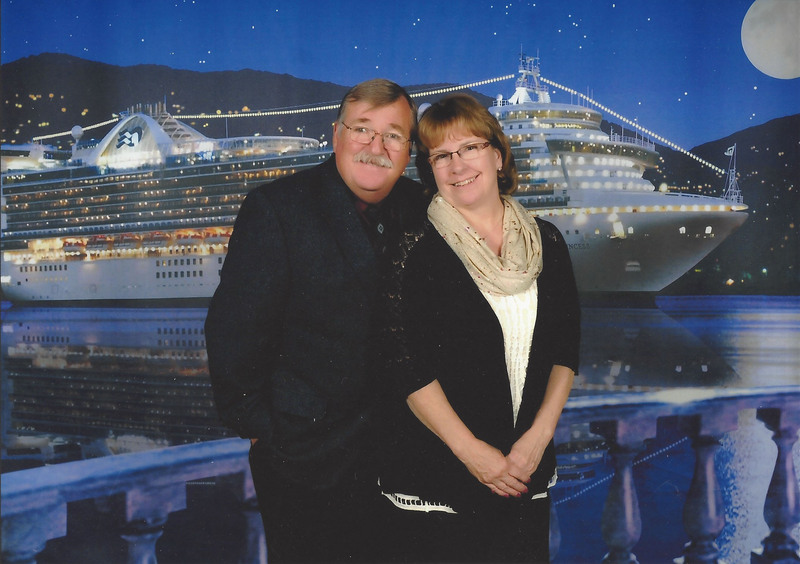 It was time for the Ruby Princess to head toward Victoria, Canada. The voyage was more than 48 hours, of course sleeping two nights helped pass . There were always many activities the days we were at sea. After lunch the four of us went to a movie. The Longest Ride was showing and Debbie and I are both Nicholas Sparks fans. The guys actually enjoyed it too but were quick to tell us real men can’t live up to the “romance” Nicholas Sparks writes about. It’s ok, we love our real men. Sea day meant formal dining so we all tried to look our best. 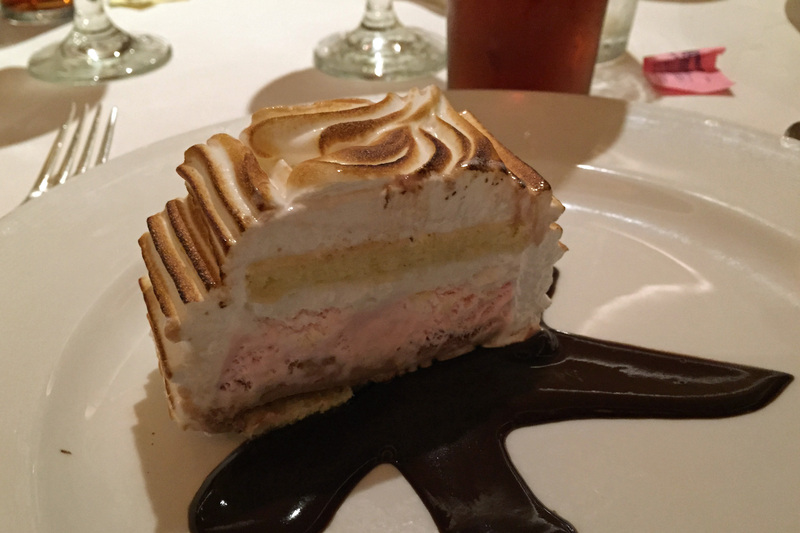 The main entrée was lobster, the dessert baked Alaska, and always many courses in between. 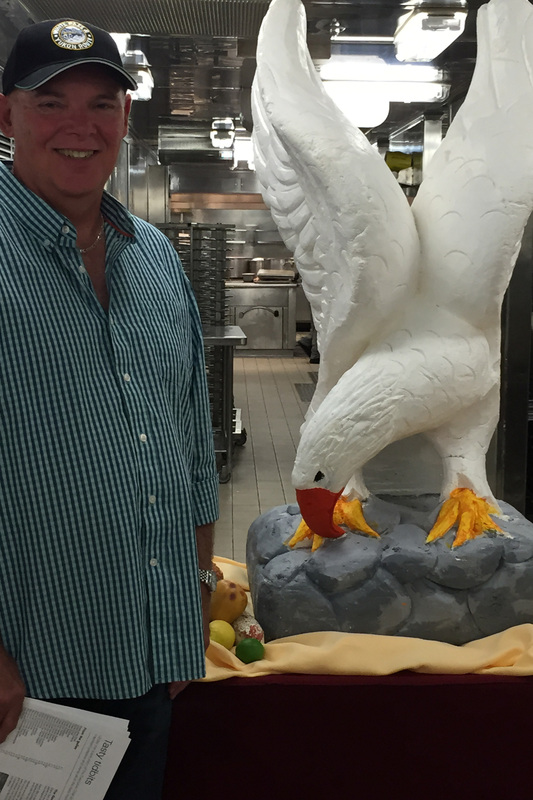 We were surprised by a parade of baked Alaskas with the wait and kitchen staff joining in. We waved our napkins as was customary and applauded the hard-working staff that had made all our meals not only delicious but beautiful as well. 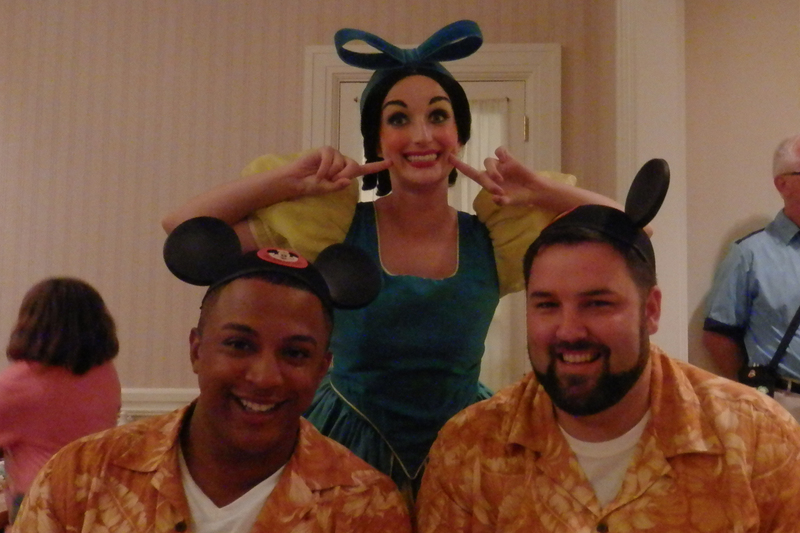 We had some photos with our waiter and junior waiter, both fun and helpful guys. 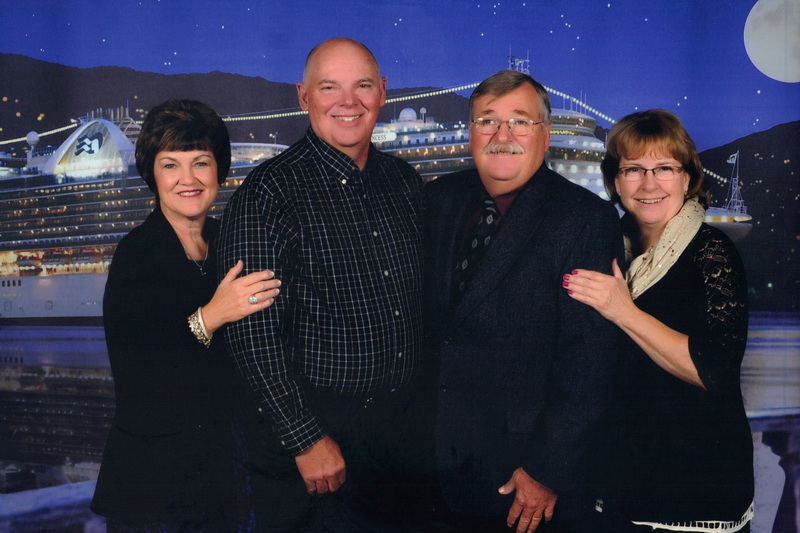 Formal pics after dinner We thought a group pic with the Ruby Princess background would be a great keepsake . That evening’s entertainment was titled The Colors of the World, it was a musical extravaganza with song and dance from around the world. It seemed fitting because for 7 days we were taken care of in one way or another by men and women from many different countries. We visited with a young man in one of the gift shops who was from Ukraine and I asked him why there were so few Americans working onboard. He smiled and thought for a while and with a thick accent finally answered, “I want to be politically correct with my answer, I think Americans have so many options for employment they don’t need this”. He explained he worked for 6 months, off 2 months, then 6 months and off 3 months, he worked 7 days a week, no holidays. 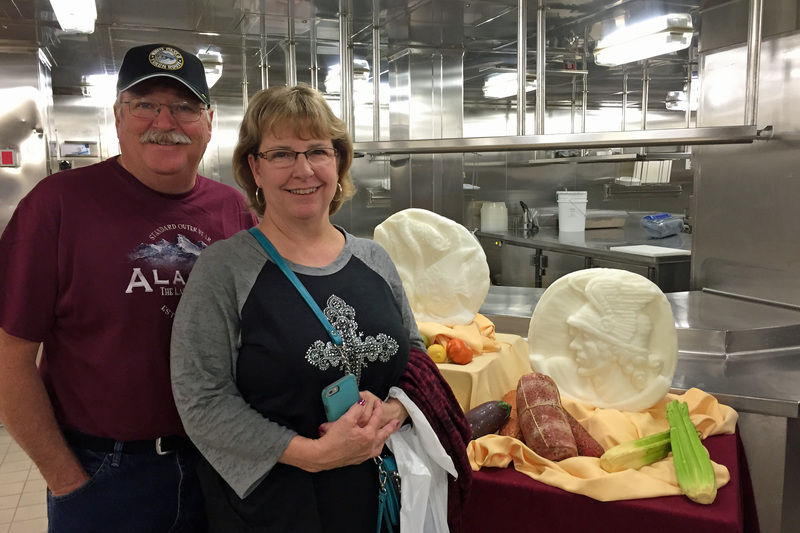 Our last full day aboard started a little slower, a leisurely breakfast and a late morning tour of the galley (kitchen). 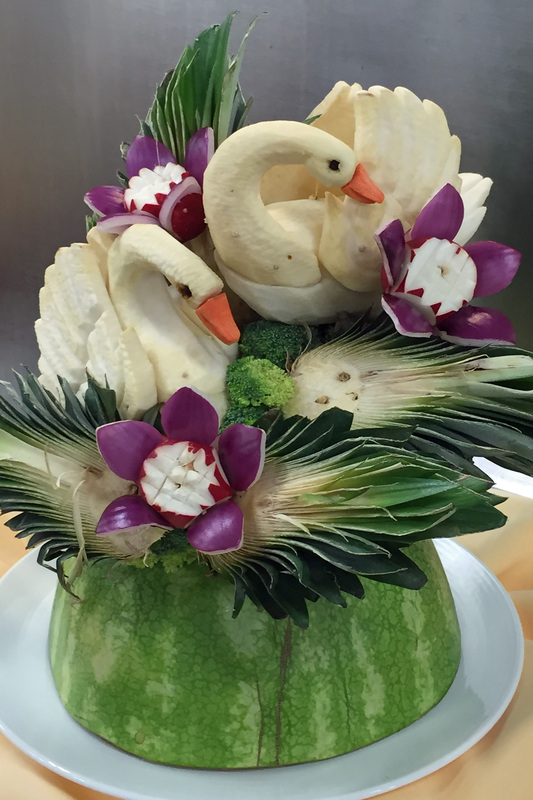 On the tour there were beautiful food carvings Our Executive Chef and Maître D began the tour with a food preparation demonstration. They were both Italian and gave a humorous and interesting presentation. They explained that 500+ of the crew of 1,150 were involved in food in some way. 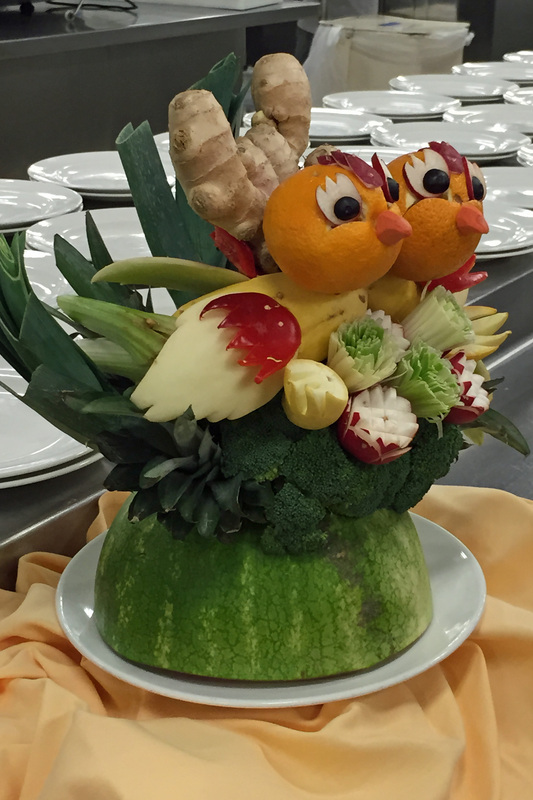 They said feeding 3,300 passengers was a huge task but they took great pride in the cleanliness of the galleys and dining rooms and wanted our dining experience to be the best we had ever had. I think it was a job well done. The tour ended with them announcing there would be a Mexican feast for lunch. We were anxious to see the Italian version of Mexican food. I can testify it was different but delicious. 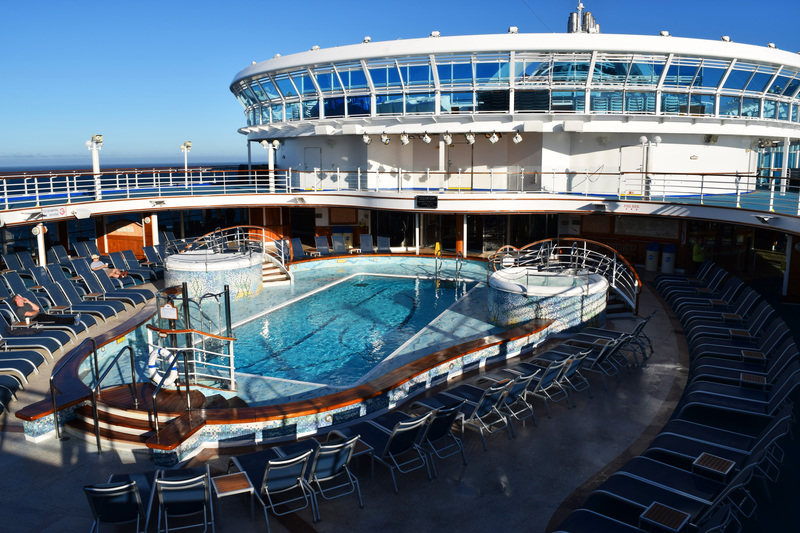 The ship was beautiful and I wanted to share a few pictures of it There was a grand spiral staircase and multiple pools for those brave enough to swim. At lunch our evening dinner waiter was working on the 15th deck, this deck had 3 different buffets everyday for breakfast, lunch and dinner. 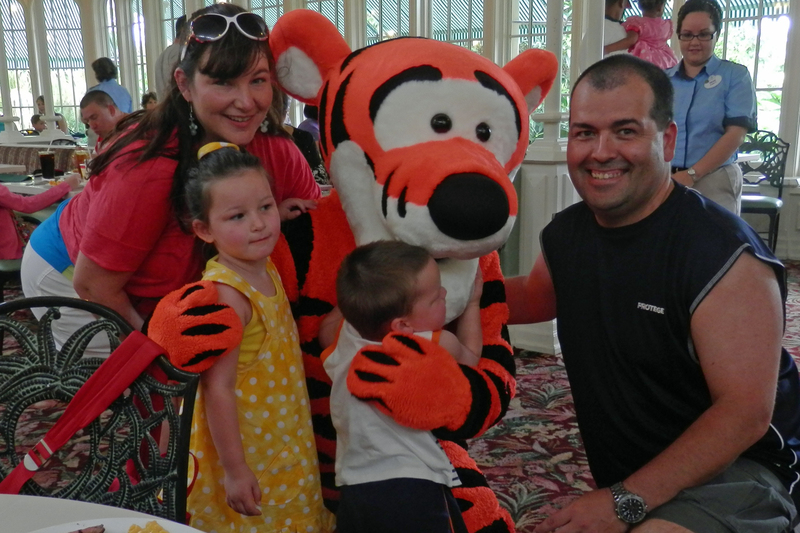 His name was Nomer, he was from the Philippines, a family man with 2 children and a wife he was supporting. Most of the crew worked multiple shifts with breaks during the day, Nomer had worked for Princess for 15 years. 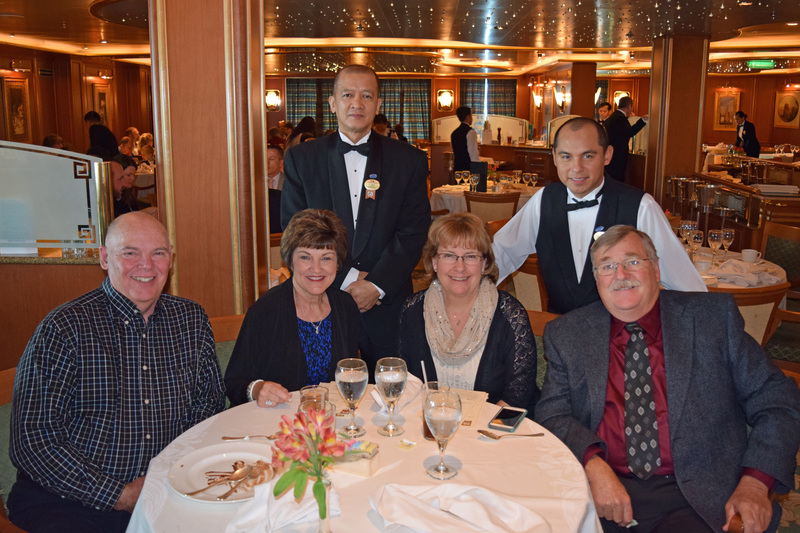 The four of us were seated at a wonderful ocean view table and as I enjoyed the calm ocean waters I asked him if he had ever been frightened on one of the cruises. He said only once, many years ago on this same Alaskan cruise but in late October. He said the waves got as high as the 15th deck, there were huge pieces of glaciers in the ocean and the ship was rocking so violently no one could walk without holding on to something and most of the passengers were ill from the motion. Nomer told us he thought he might be in the bottom of the ocean that day but now cruise ships no longer travel to Alaska after the end of September. Chuck, Debbie, Mike and I spent many hours on the 15th deck at one of our many favorite ocean view tables. 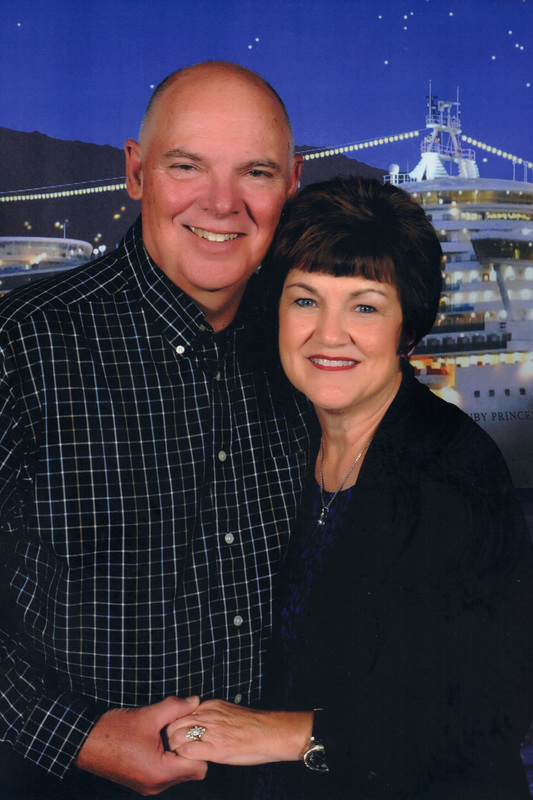 Often we would just share sodas and conversation or snap photos, but some of my fondest cruise memories happened there. On the last evening, as the Ruby Princess cruised toward Victoria, I think we were all reflecting on the week’s experiences. Debbie, always the clever one, commented, “if a whale would just do a big belly flop this moment would be perfect”. I laughed again just typing her words. We arrived in Victoria, Canada in the evening, we were only at that port from 7:00 to 11:15, our shortest port of call. 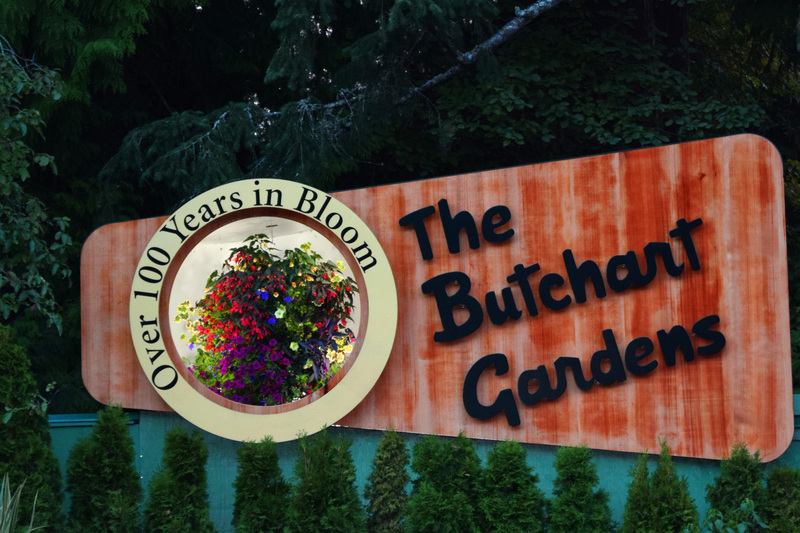 We had booked the excursion to Butchart Gardens. A bus took us to the gardens and our driver was very informative. 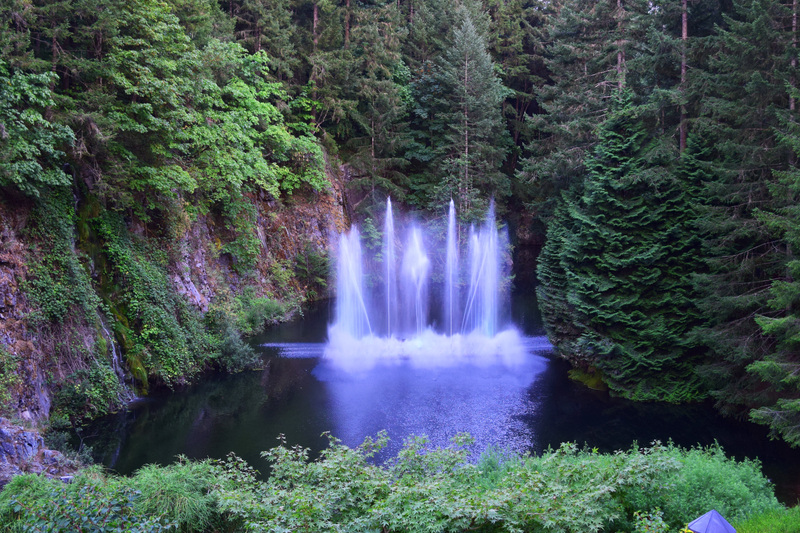 We learned the gardens began from an idea Jennie Butchart had to beautify the worked-out limestone quarry which had supplied her husband’s cement plant. 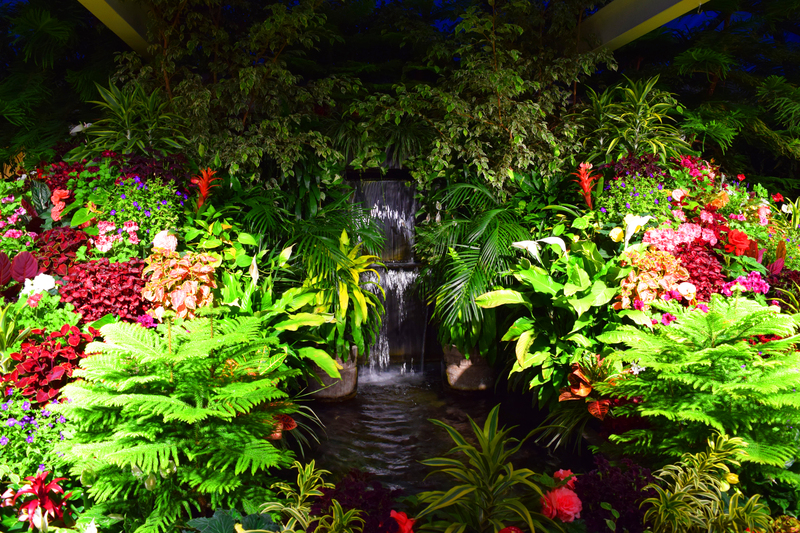 The park is still owned and operated by the same family and nearly 1 million people visit it every year. Being a gardener myself the description of this excursion had me at hello. 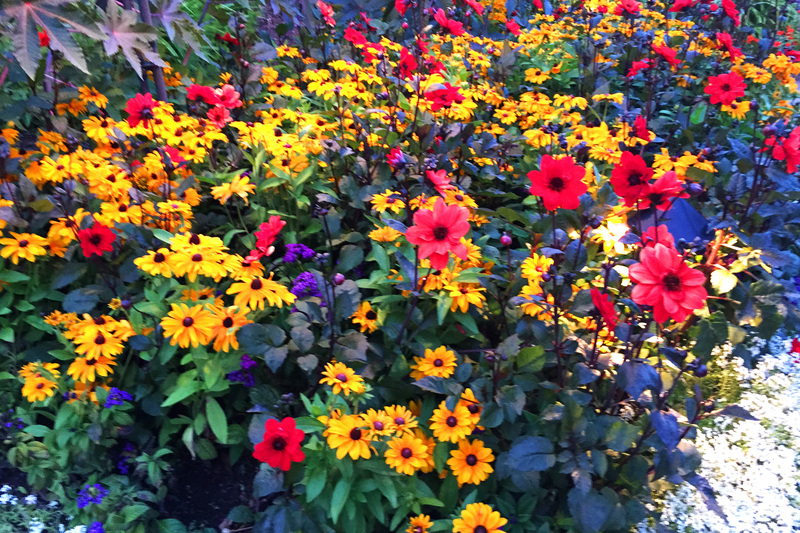 I visited with a young man who worked at the gardens and asked him when did the actual gardening take place. 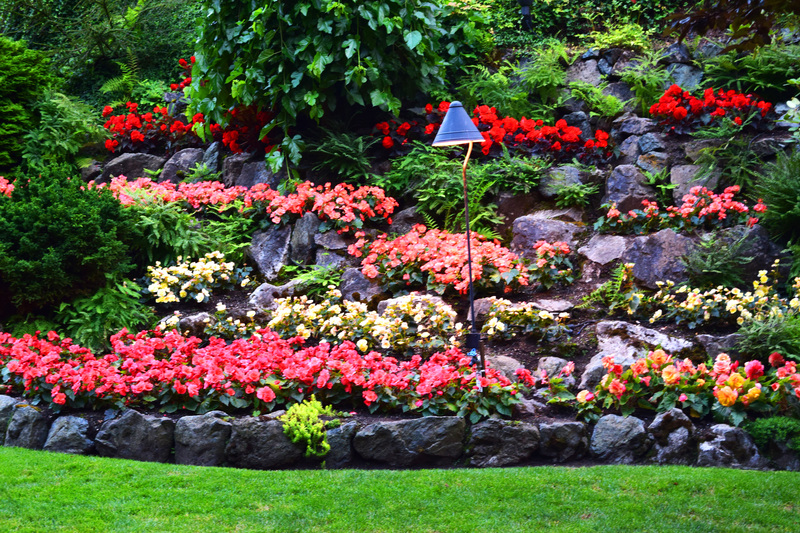 Every gardener knows there is weeding, planting, trimming, fertilizing, mulching and more. 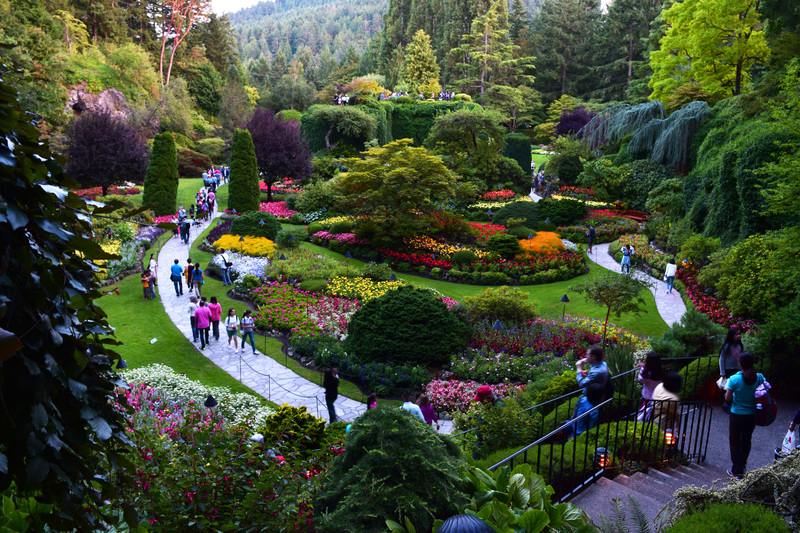 He said the gardens were open 365 days a year, even Christmas Day, one of their busiest. He explained when the gardens closed at night the first workers cleaned the park and then about 3 or 4 in the morning the gardeners came in and worked until the park opened. 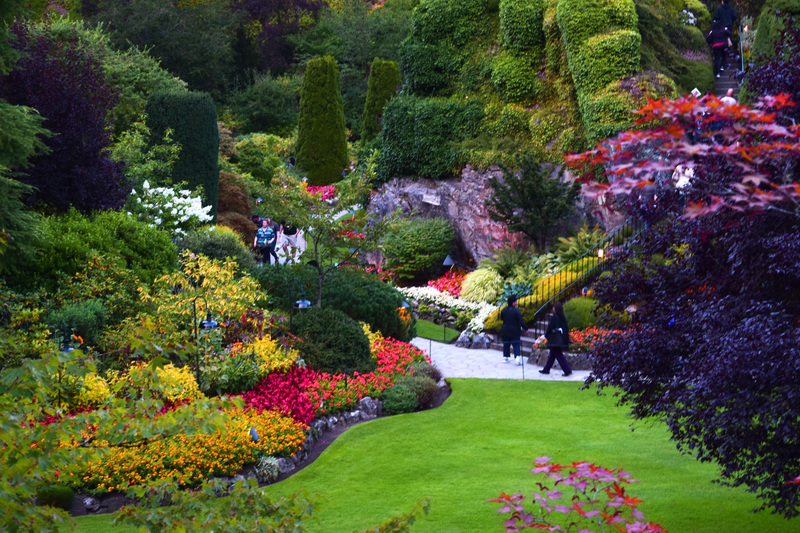 He said then the gardeners would head back to their greenhouses and no one ever saw them, all gardening was nocturnal. I know Victoria is a city I would like to visit again. The bus ride gave us enough of a glimpse of so many sights I know there is much more to explore. Another cruise another time. 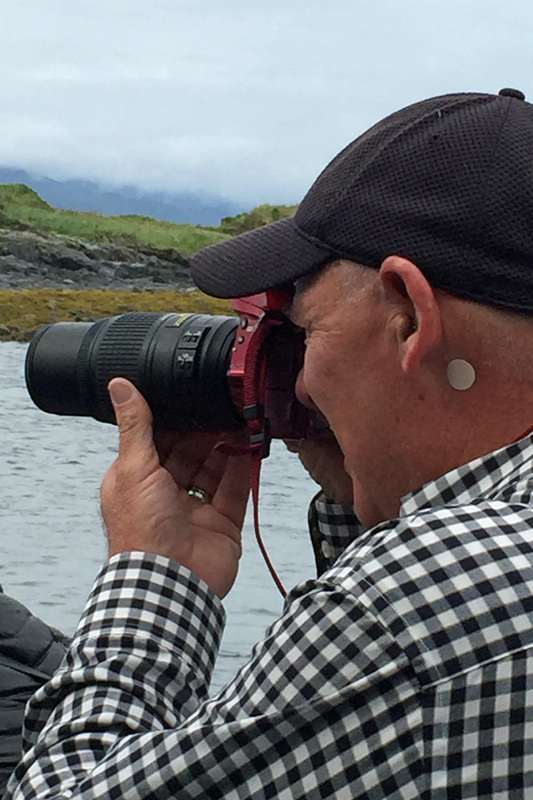 I think this may be the longest blog I have ever written and I want to thank my sweet husband for so many beautiful photos, Chuck and Debbie shared great ones too. I have in no way covered everything we did and our little group may be the only four people who read and enjoy my words but that is ok. I would love for Mike, Chuck and Debbie to add any and everything I didn’t mention or I simply forgot. It was a vacation of a lifetime and I think we did what I mentioned in my very first paragraph, we fell in love with the beauty and wild frontier of Alaska and did indeed carry home memories we will always treasure. 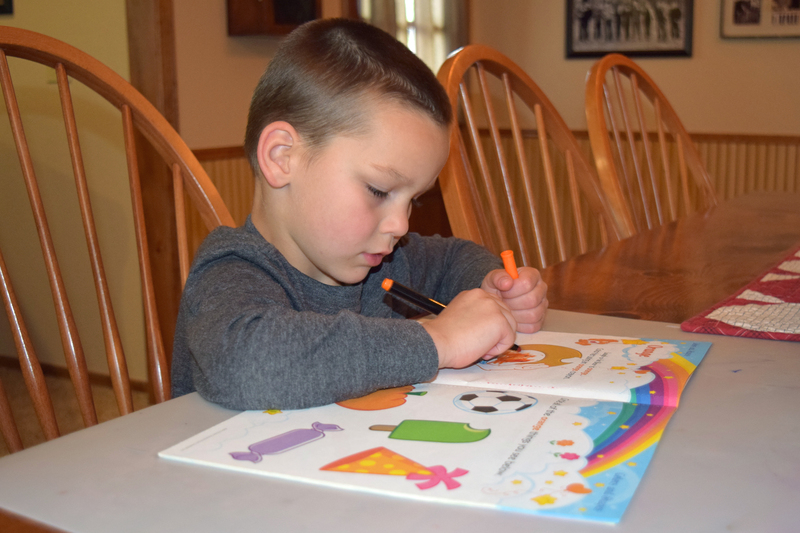 Mike and I kept our youngest grandson, Gabriel, for the final three weeks of school. It was enjoyable and sometimes challenging. 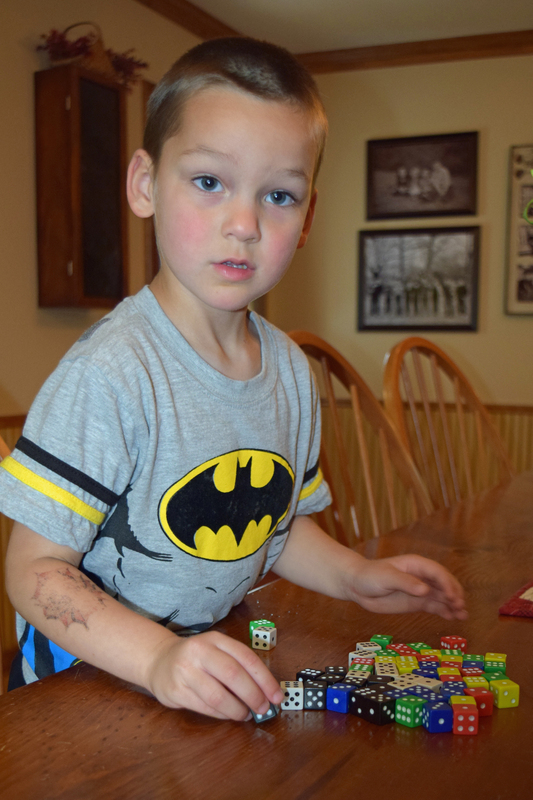 He recently turned four and is a busy little man. Mike, or I should say Grandad, had him for the first hour he arrived, I am not an early riser and Grandad enjoyed his early time with our Gabriel. Grandad and Gabriel are best buddies. As a side note please know that I am totally aware that Webster prefers to spell Grandad with two ds. Spellcheck is always annoyed with me. My version is the way the grands pronounce the name they call their grandfather. Sorry if this bothers anyone, I am a correct grammar/spelling freak but since I am also the writer I get to choose what is OK for my blog. I played hours of Hulk, policeman, Doctor, house, trucks, hide and go seek, Ipad, and watched Disney Junior, Mickey Mouse Clubhouse and Monsters Inc. We played outside as often as the weather allowed, sometimes cleaning the front porch, gardening, or four-wheel riding. We did errands and he was a great little helper. We had lunches in many different restaurants and he was a polite well-behaved addition to our twosome. We enjoyed our days with Gabriel but I worried I was being neglectful of his pre-school training. I decided every day we would spend a little time “learning”. I started with the alphabet, choosing H because H is for horse and Gabe loves horses. We worked on colors, he is great at those. 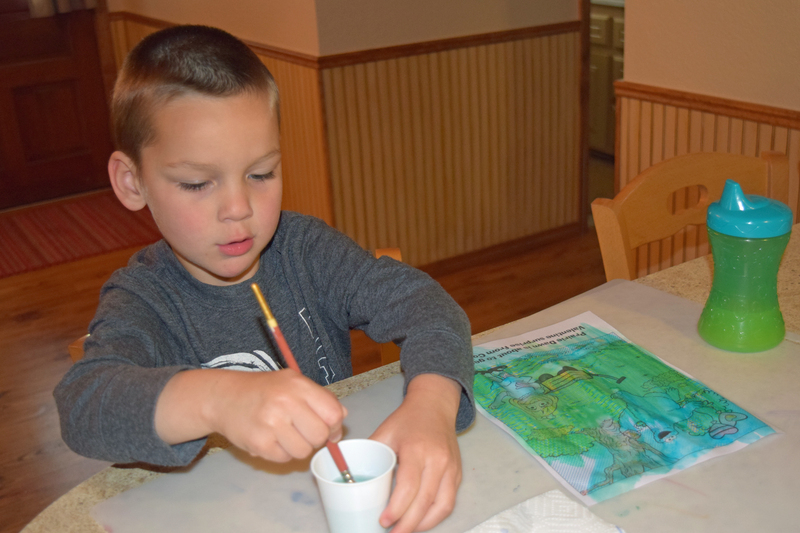 We painted one picture daily, using paint with water pages. He totally loved the cup of water with the paint brush. “Are we playing school?”, he asked. “Nana, do you want to be a teacher when you grow up?”, another Gabriel question. I love his questions, and our conversations. One day I fixed “busketty”, Gabriel’s favorite meal. He loves warm hot rolls with his spaghetti but I only had the makings for garlic toast so I thought that would be a good substitute. I had too many things going on that day and the toast broiled a few seconds too long. The edges were a little brown but I was quick to formulate a plan, explaining to Gabriel that Colton (his big cousin he loves and adores) prefers his toast with these dark golden edges. Gabriel contemplated my words, studied the toast and just when I thought I had successfully finessed my grandson he looks up and says, “I wish my Colton was here, I would give him my toast”. Our three weeks with Gabriel has come and gone but we made some sweet memories together. My two youngest grandchildren love to visit “Old McDonald”, their name for the fast food place known for its golden arches. I, of course, do not share their love for this place but my desire to please them does occasionally have us partaking of happy meals. Grace and Gabriel always seem to enjoy their boxed food but the highlight of the visit is playing in the indoor PlayPlace. We made a golden arch stop this past week. My Grace and Gabriel made quick work of their burgers, gogurts and apple juice anxious for the climbing and sliding to begin. The playground area has tables for the parents, grandparents and assorted other care givers to sit and for me, endure the least amount of time I feel will make my little ones content with the experience. My biggest problem with the playground is the garden of germs I fear exists inside it. Everyone who knows me understands I can be a little germaphobic, (could NOT find that word in the dictionary, who knew?) I want things neat and orderly and I like things clean and this playground will never meet my standards. There are other parks for small children but the Oklahoma heat pushed us to choose the ONLY indoor playground in our city. As my grands were playing I noticed a large group in the center of the room. There were super cute little ones in high chairs, they had very curly hair and beautiful skin the color of café au lait, three beauties to be exact. I could tell there were many other children with this group and I decided perhaps a small day care was there for lunch. I observed the small ones feeding themselves fries and worried (I do that) they would choke. After the fries came ice cream cones, the cones were handed to them and the mess that followed was monumental. It was at this time that I noticed the older children were entering the play area carrying their ice cream cones. There is a sign that clearly states no food allowed in the PlayPlace. One little boy carried his cone into the playground but was eating it as fast as he could so I thought perhaps there wouldn’t be too big a problem. Moments later another little boy had his cone dripping all the way down his hand and arm and onto the floor and went running into the playground. At this point I went to the entrance and called for my Grace and Gabriel, I told them we had to leave because there was a child dripping ice cream all over the equipment. Even though I had made it clear I was not going to argue with the woman she never hushed. Mike told me as we left some other parent reported the situation to the Old McDonald staff and they spoke to the group about the “no food allowed” rule. I noticed the other guests were giving me looks like “you go girl” as we exited, I thought they were happy for the rule enforcement. Later Mike explained to me what was said while the kids and I were washing. She loudly told her children, (I guess they were not a small daycare), not to grow up and be like “them” (Mike and I). She told them we were prejudiced and did not like them because they were “mixed”. I have thought about those words a lot these last few days, “prejudice” and “mixed”. I have decided I am both, my family is mixed in many ways, we have Native American ancestors, we are of French descent and I am sure a multitude of other nationalities. I have one black son in-law and two Caucasian, I love all three. I am most certainly “mixed”. Now for prejudice, I am also prejudiced, we are all prejudiced. I have little to no tolerance for laziness, I cannot abide ignorance (when it is a choice), and I detest dishonesty and hypocrisy. But wait, there are more, I am also prejudiced toward abusers and molesters, for those monsters I have absolutely zero tolerance. Yes, I harbor prejudices. My Old McDonald experience has made me reflect on myself. I have admitted to being mixed and prejudiced and I am ok with both. I know I am also open minded, I love with all my being and I always try to do the right thing. I am ok with that too. February 14th is always a day to think about love. I am truly blessed in that area. I love so many people, I even have things I love, places I love, and ideas I love. I have friends that are beyond special, family I would do anything for and a man I love more than life. You may think I have forgotten my love for our Heavenly Father, but no, I know every love I have previously mentioned came from Him. Even though my Valentine and I have celebrated this day 42 times (40 years as husband and wife) we planned a short outing for this one. We only drove as far as Tulsa but he planned the days filled with things I love. We ate dinner in a nice restaurant, spent a little time at the Riverspirit Casino (an activity I enjoy, him not so much) then spent the night at the beautiful Doubletree Hotel. The next day there was a wonderful Vintage Antique Show. He made sure I was there before 9:00 a.m. to enjoy early buying privileges. There was a 200+ year old cupboard I asked about fitting in the truck, he was sure he could find a way. As most antiquers are likely to do, I did a quick run through of the building then walked it all again, he never complained and offered to make a package run to the truck. 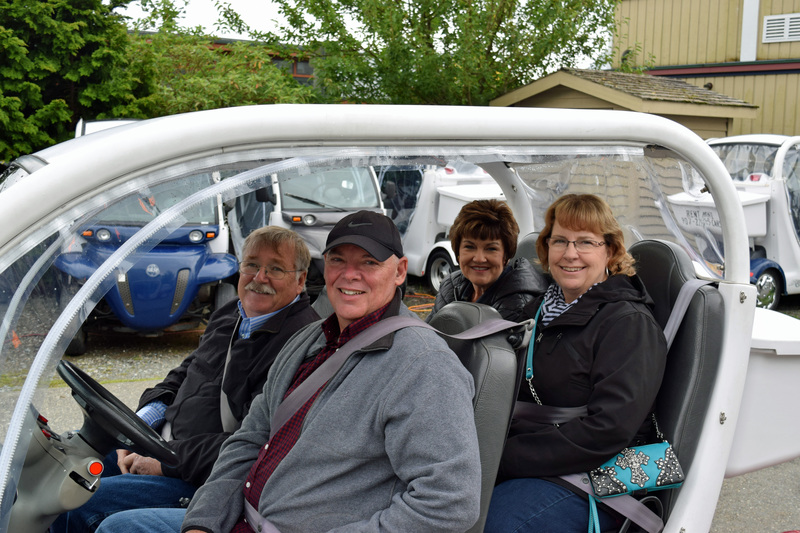 We eventually headed to Jinx, one of my favorite antiquing cities in Oklahoma and later had lunch at our favorite steakhouse. The day included some other shopping, Michaels for some scrapbooking supplies, my Michael doesn’t particularly love that store and Bed Bath and Beyond, which I know is not on his top 10 list either. My Valentine and I don’t always exchange gifts anymore, we are of the age of having everything we need and most of what we want. Having made that statement I totally love and appreciate that he gave me a couple of days he planned with things I love. I will finish by saying, “thank you sweet Valentine, I am so glad you are mine”. This day was a little sad; I wasn’t really ready to head home. 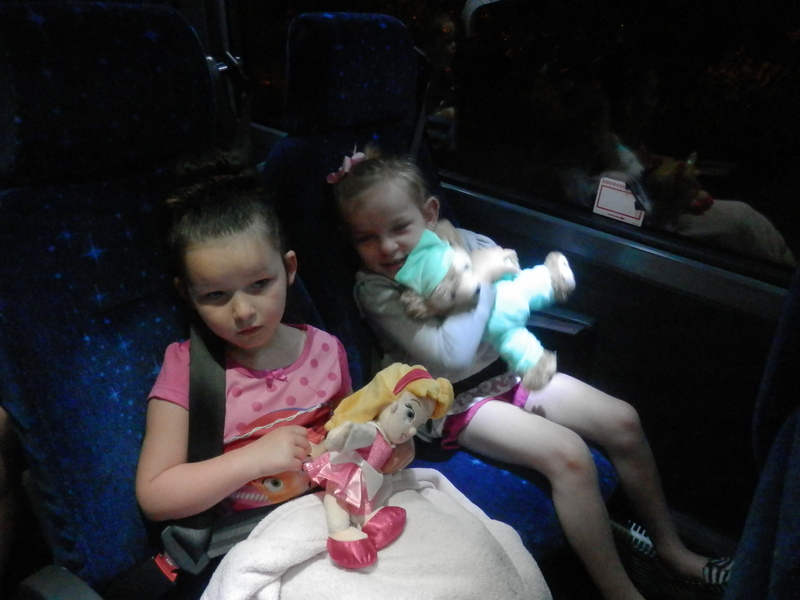 Our return trip started super early Sunday morning, we had to be at the Disney Magical Bus stop at 4:00 a.m. The big plus side of this plan was being in Oklahoma City at 11:15 a.m., giving all our Monday morning workers the day to rest and prepare for their work week. Ah, the best laid plans of mice and men, little did we know the day ahead of us. We arrived at the airport on time, successfully negotiated the security and luggage checks and found our terminal. The plane boarded, we thought soon to be Houston bound (our connection). Then the drama began; we waited onboard one and a half hours for the repair of mechanical problems with our plane, never good news. We began to feel déjà vu; Tuesday was happening all over again. Finally, we arrived in Houston on a repaired airplane and yep, you guessed it, our connecting flight was long gone. We eventually found a United Airlines Manager who became our friend and lifeline. We were able to get four standby tickets and the plan was for Courtney, Roy, Colton, and Kinsey to be on the first Oklahoma bound flight. 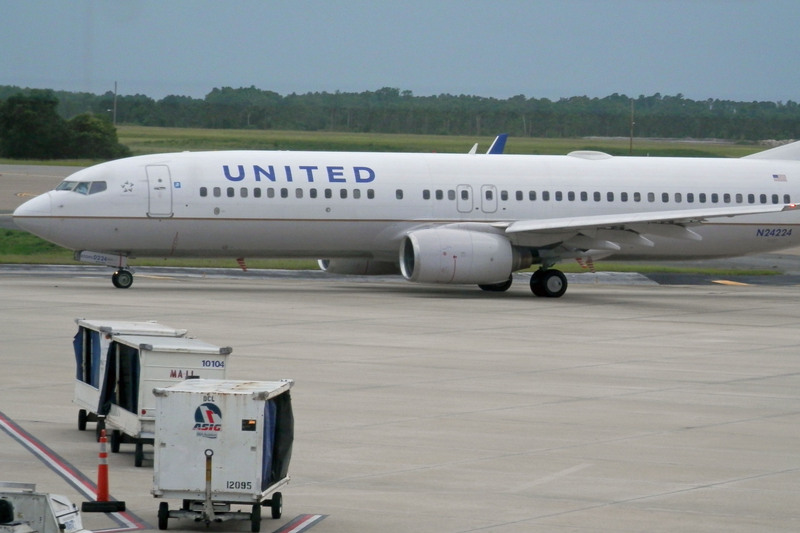 This was not an easy process; they boarded one at a time and had a United employee working diligently on their behalf, without her help they would never have had seats. Kinsey was the last one to board (Mike stayed with Kinsey so she was never alone during the wait). The United “angel” pleaded with the pilot that she could make room for this little girl, she told him she was very small and her only luggage was a teddy bear. She had assistants bring her pieces from the luggage hold then held them up for the plane to view. If no one claimed the luggage it was removed from the plane. A few large suitcases were discarded and Kinsey was allowed to board. In a period of 3 to 4 hours the nine of us left stranded in Houston collected enough standby tickets to wallpaper a room. None of the standby flights were successful for us. Our United Manager, by now he is Brandon to me, told me he wanted to secure each one in our group a confirmed flight for the next day and hotel rooms. The weather was deteriorating quickly and he explained that soon flights would start being cancelled, every passenger in the airport would have to reschedule and hotel rooms would be filled. I watched a line of two people (I was one of the two) grow to a line of more than one hundred unhappy frustrated travelers. With Brandon’s help our group headed to a hotel and we were given vouchers to pay for food for the evening. 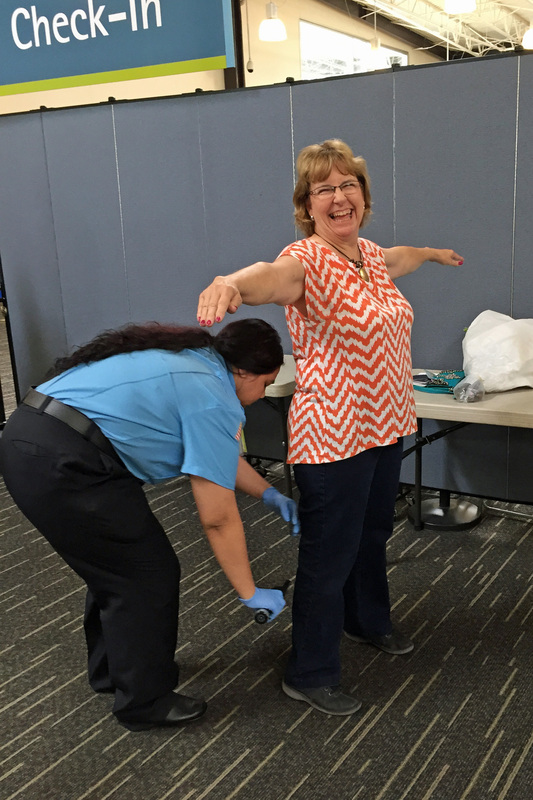 The afternoon we spent in that stormy Houston airport terminal was not all negative. When you have hours to pass that can open the door to communication which can lead to strengthening relationships. I want to mention that in the hours of conversation I shared with Brandon I learned that United Airlines is a reputable company that tries to do the right thing. Months earlier our group of thirteen had booked tickets to and from Florida, this consisted of a total of four flights. The actual number of flights changed to nine flying on two different airlines, and of the nine flights the thirteen of us traveled together on only two flights. Brandon knew there was no way to give us back the days we lost flying (or NOT flying) with his airline but he did what was in his power to do. Flight vouchers were issued to all thirteen of us, covering the entire cost of our flights. This was an exhausting and extremely stressful day, a Sunday I never want to repeat but we survived with a vacation story none of us will ever forget. I always try to find the positive side and in this situation I am happy to say all thirteen of us are taking vacations in 2014 with our flights already paid for. Charity, Mike, Grace, Gabriel and Tyler had another 7:00 a.m. flight, this time they boarded, flew and arrived in OKC, on schedule and basically problem free. Jake and Eric were able to change their 1:15 flight to a 10:30 a.m. and traveled safely home. Mike and I had a 11:15 a.m. flight and spent our Monday morning shopping. I found a Brighton shop and made my layover more enjoyable. We brought up the rear and were the last, exactly as we wanted it, to step back on Oklahoma soil. Our travel days were far from ideal but I was grateful we were all safe and hoped someday we would all look back and share a chuckle. Vacations are really about spending time together, experiencing new things and most importantly creating memories. 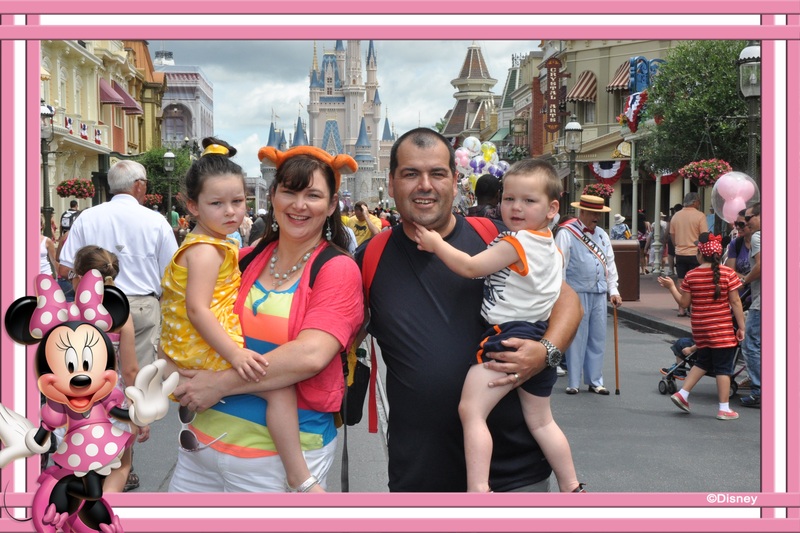 I have shared my memories of our Disney trip but there are so many more, I would love for the rest of my family to add to this. Each one of us had a different experience, my words have of course come from my perspective. 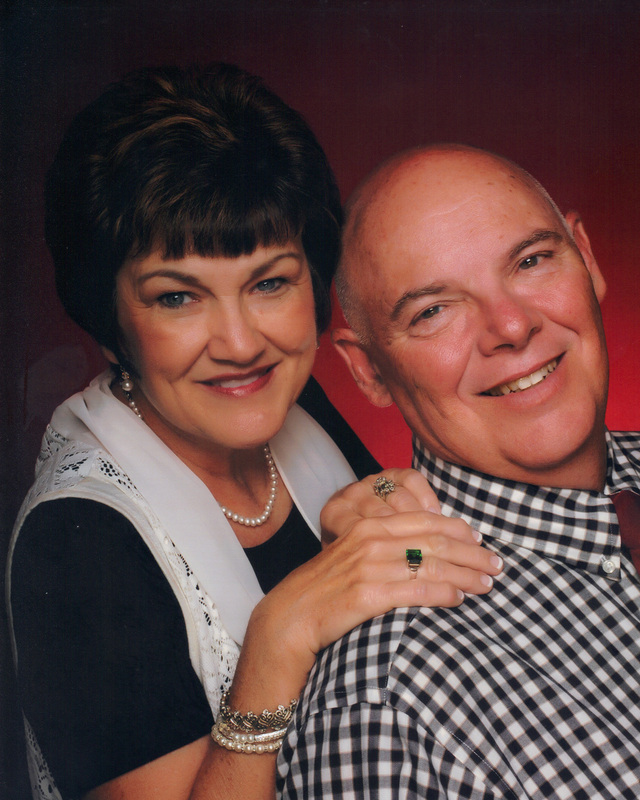 Would my dear family please add your thoughts and share at the very least a special memory. Happy blogging. 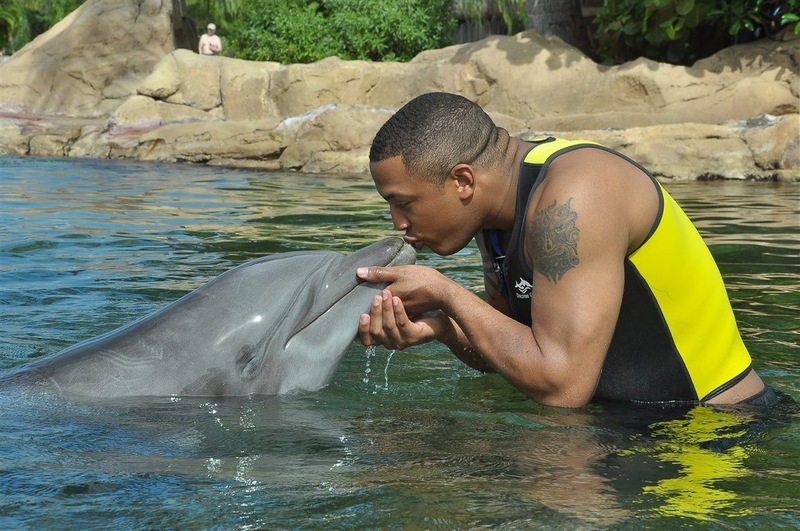 even kissed a dolphin , and had beautiful photos with them. 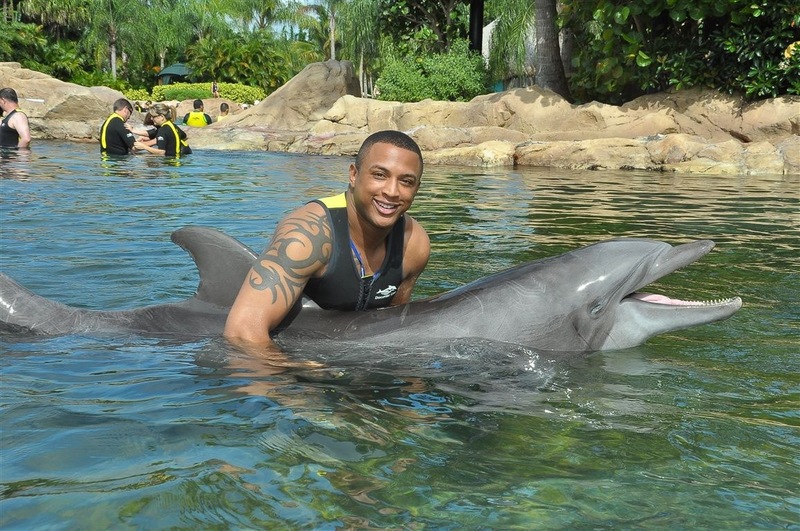 I have to admit I think I would have loved meeting the dolphins too, but oh those really tight black outfits, not sure about those. 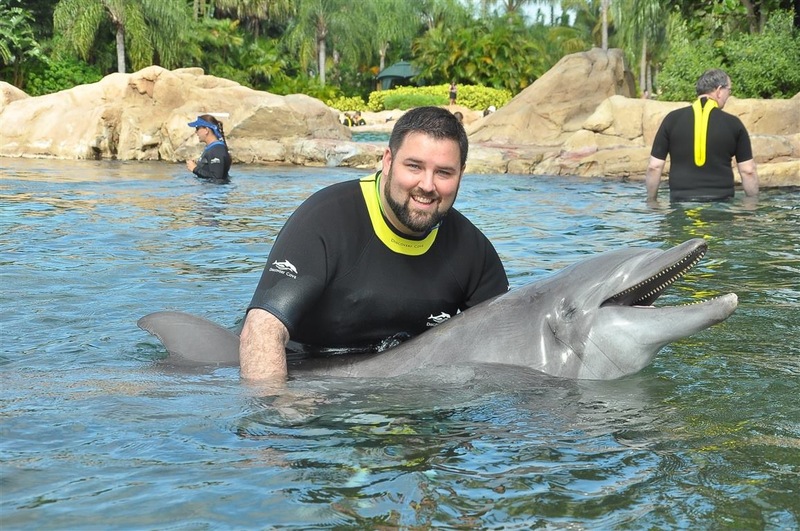 I hope Jake and Eric will add some details of their dolphin experience to this blog. 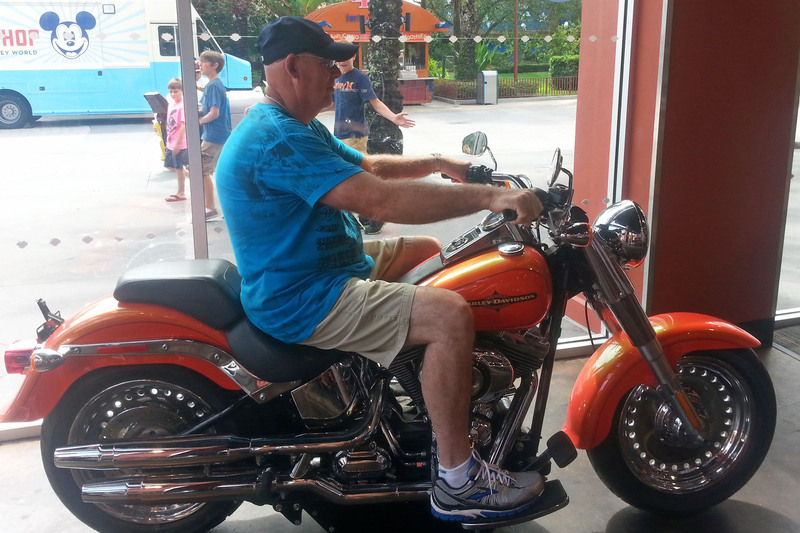 Day 4 found Tyler, our 26 year old bonus grandson, Mike and I at downtown Disney. We decided to splurge on Cirque Du Soleil tickets and their theatre is located there. After securing our seats we strolled for awhile shopping, Mike and Tyler both tried some bikes they asked if they could purchase (they were Harley’s). 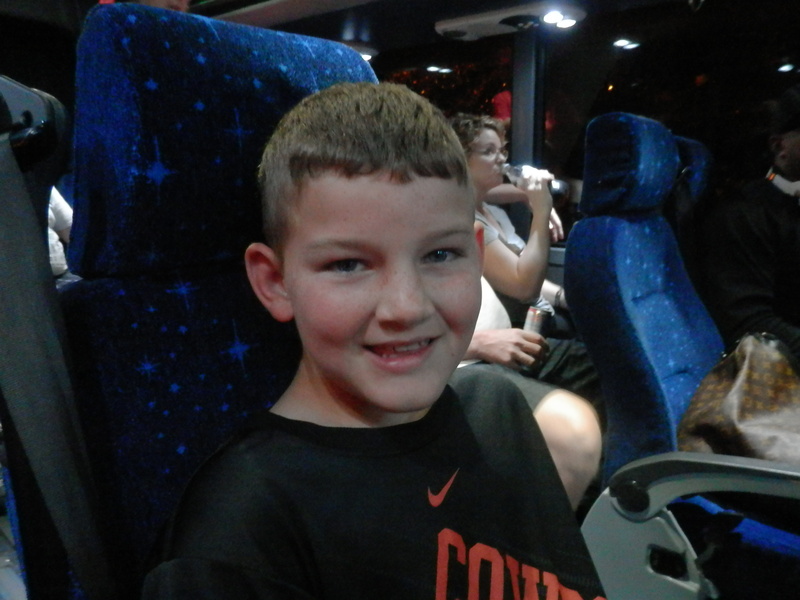 We spent many hours with Tyler on our trip; he even stayed most of the nights in our rooms. We worried he would be bored with the “old people”, but he told us many times he was having a great time and thanked us again and again for bringing him. 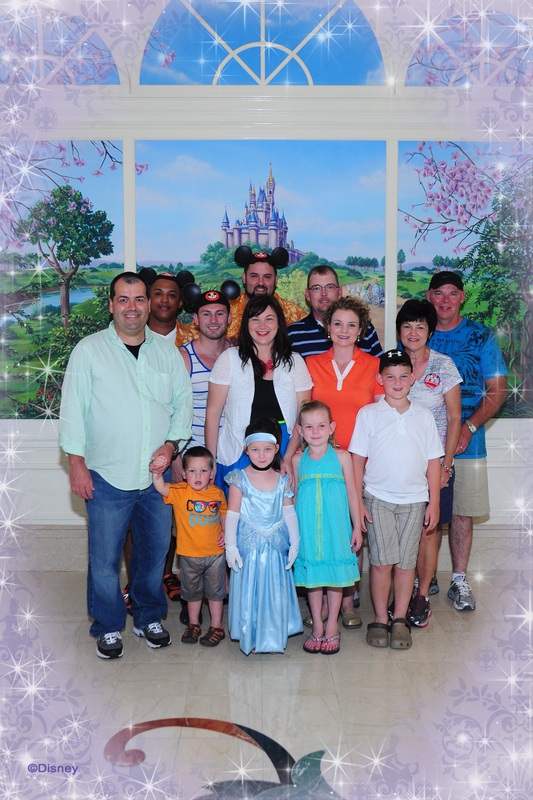 This trip was a celebration of family for Mike and me. 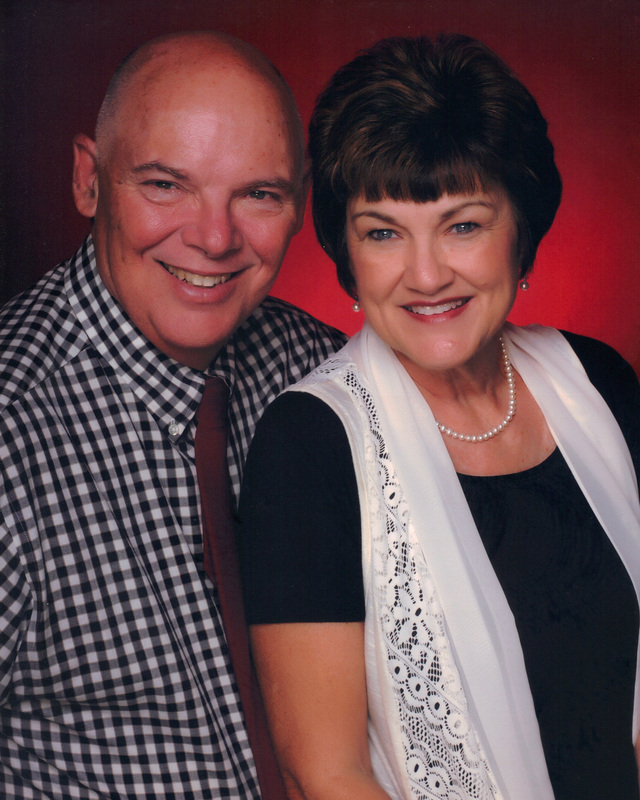 We were celebrating the beginning of our family because forty years ago this very month we were married. We had brought three generations to Florida and felt really grateful Tyler was with us. 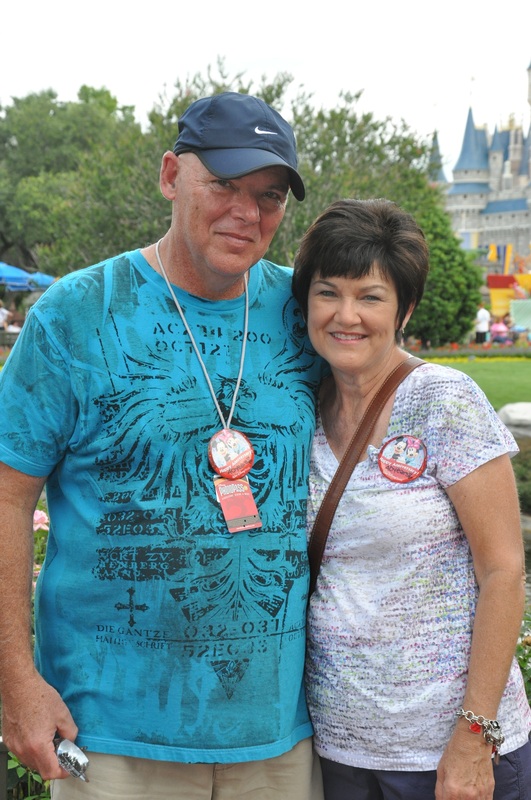 The first night we checked in Mike and I were given buttons to wear that said “happy anniversary, 40 years”. 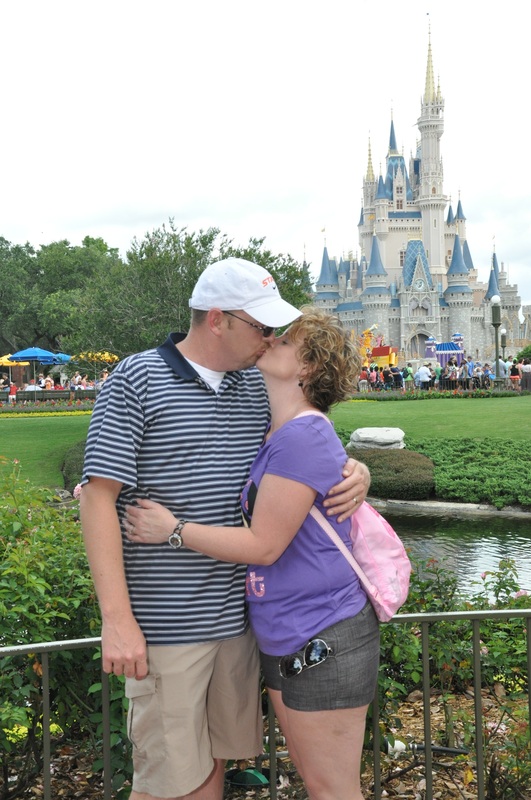 Disney staff is so well trained to notice the buttons that I bet we were told “happy anniversary” more then 100 times. These happy words made us smile every time and be thankful to be so blessed. Everyone but Jake and Eric met at The Crystal Palace for our lunch reservations. 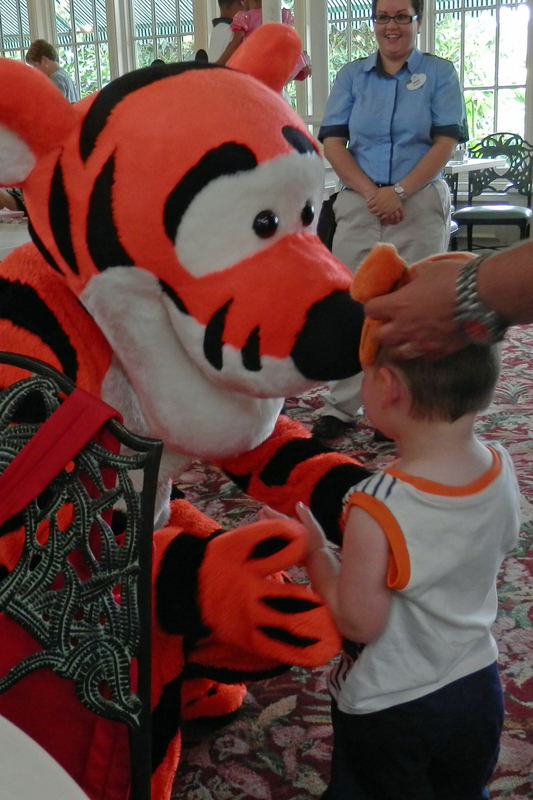 This meal included such guests as Winnie the Pooh, Eyeore, Piglet, and of course Tigger. I look back and think no one enjoyed the characters more than Gabriel . 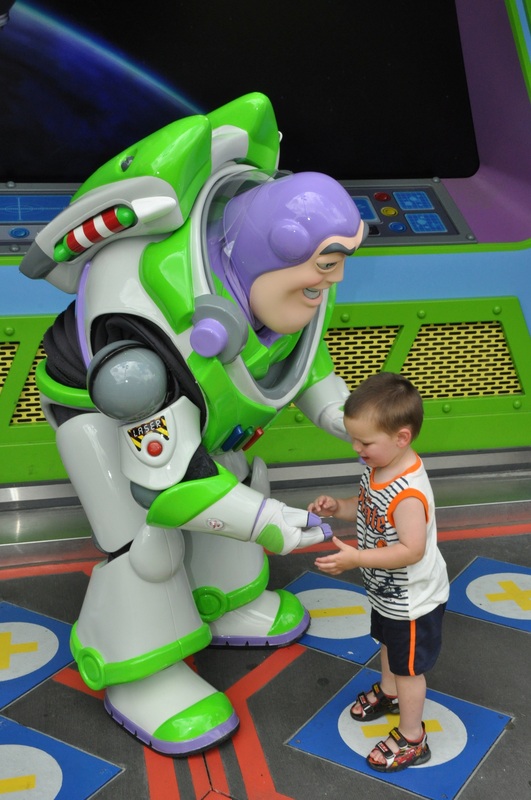 Pre-trip I had worried Gabriel, who just turned 2, was too young for the full Disney experience. 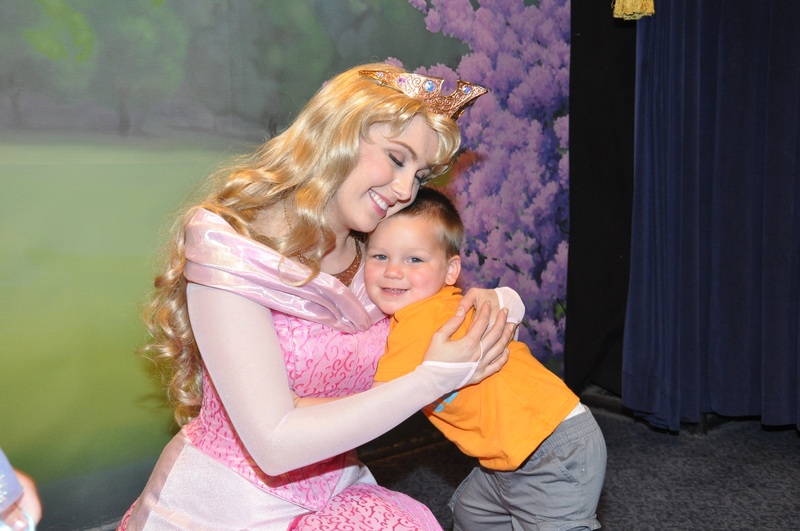 I was so wrong, he found so much he could do, so many to love and he absorbed every ounce of Disney magic possible. 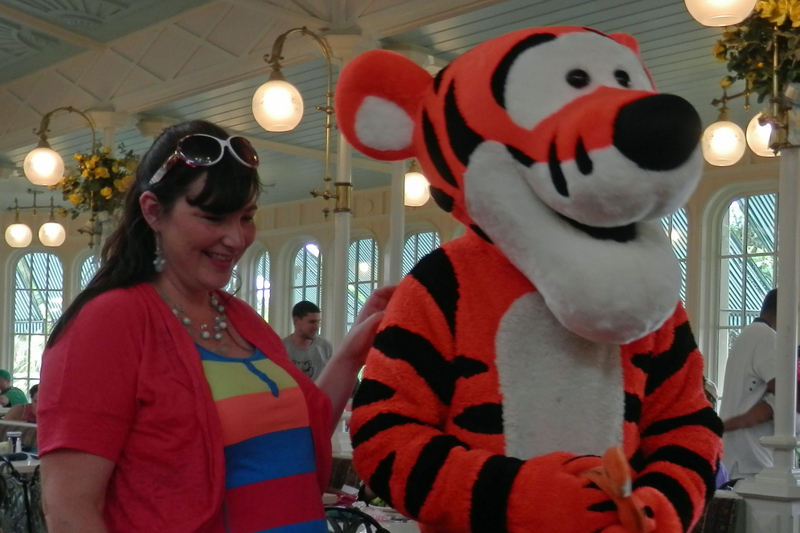 Charity has always been a Tigger fan. Roy, Courtney and Kinsey visited with Eyeore . 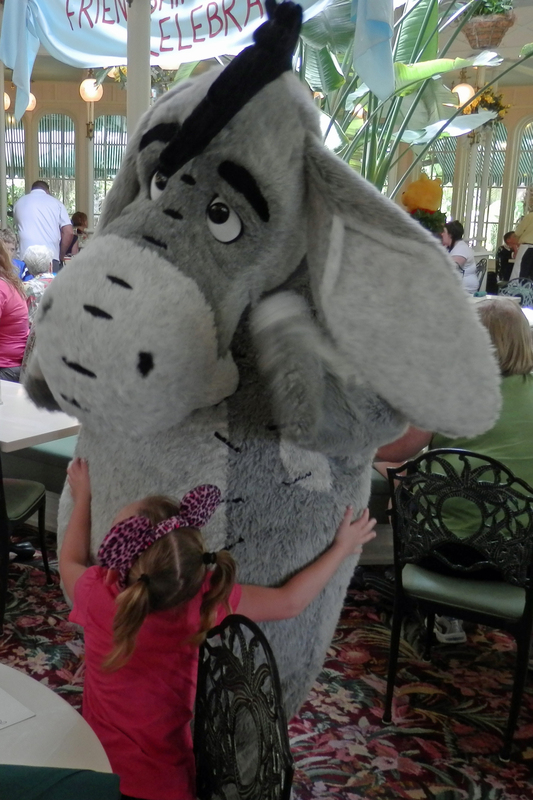 Kinsey hugged Eyeore. Lunch was satisfactory and filled our tummies, our young ones paraded with Tigger holding Gabriel’s hand, which filled our hearts. 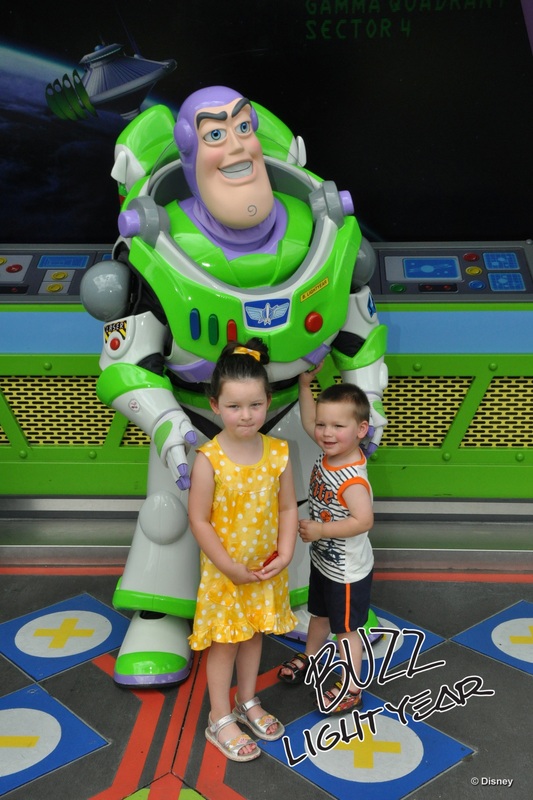 Charity, Mike, Grace and Gabriel found another photo spot and also got to meet Buzz Lightyear . After lunch we divided, this was our first really sunshiny day, translation hot day. The hot afternoon found many of us back at our resort for some much needed rest. I spent some time at the beautiful pool. 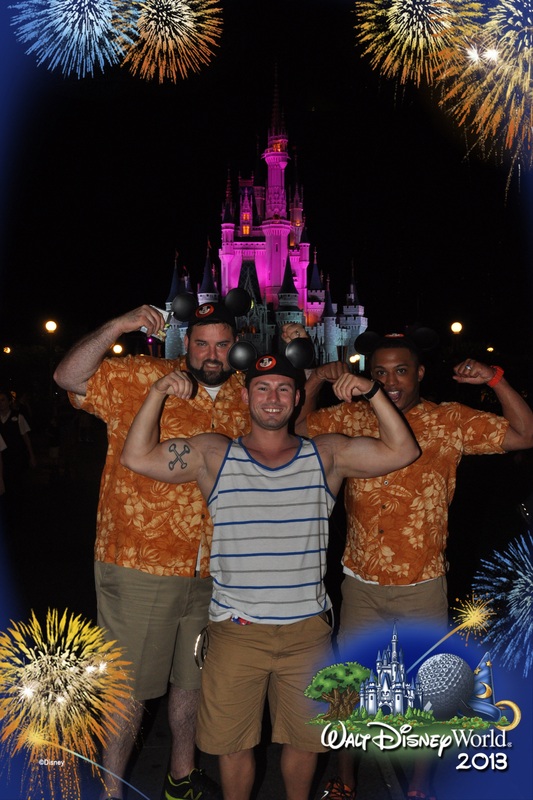 Mike, Jake, Courtney and Roy listened to a one hour presentation about Disney’s Vacation Club. We were staying at Saratoga Springs, a vacation club resort, and they were interested in the feasibility of being a member. If you are able to go to Disney yearly I think it might be a wise investment. 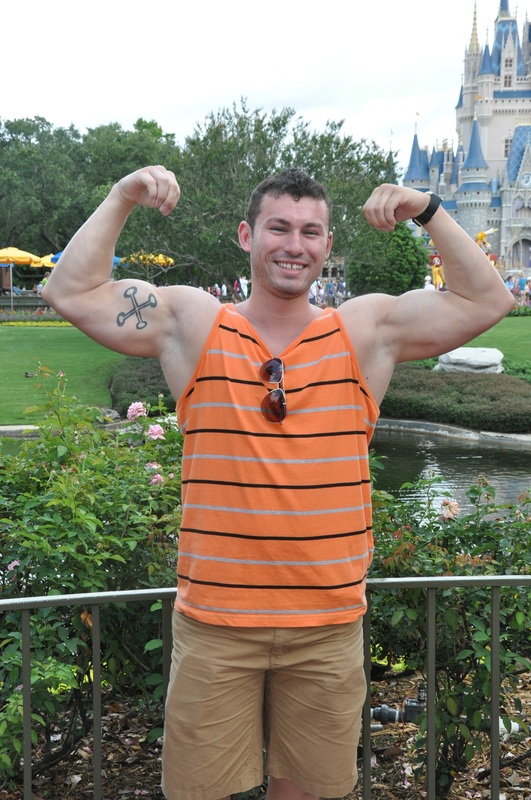 I think an annual Disney trip might diminish its specialness, maybe that’s just me. 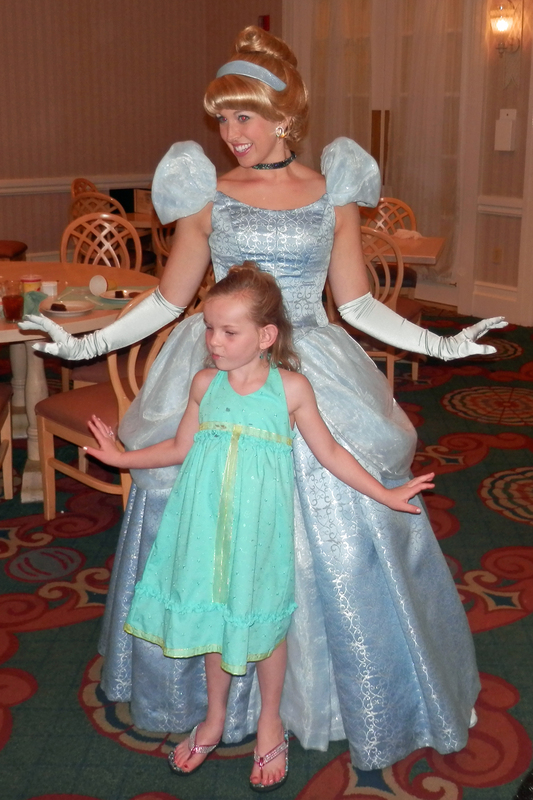 Our family had evening reservations at the Grand Floridian for dinner with Cinderella and Prince Charming. The wicked stepmother and Cinderella’s step sisters were there too. 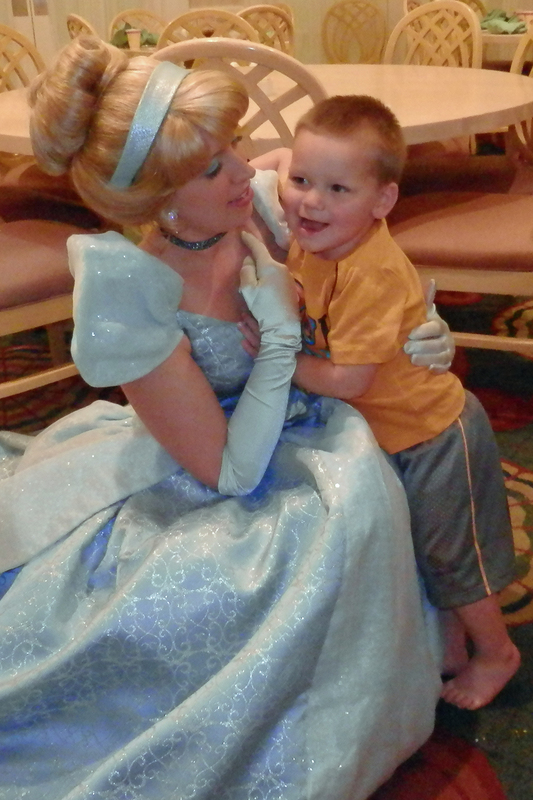 One of the sister’s was very interested in Jake and Eric ; Gabriel once again captured the heart of a princess, Cinderella. 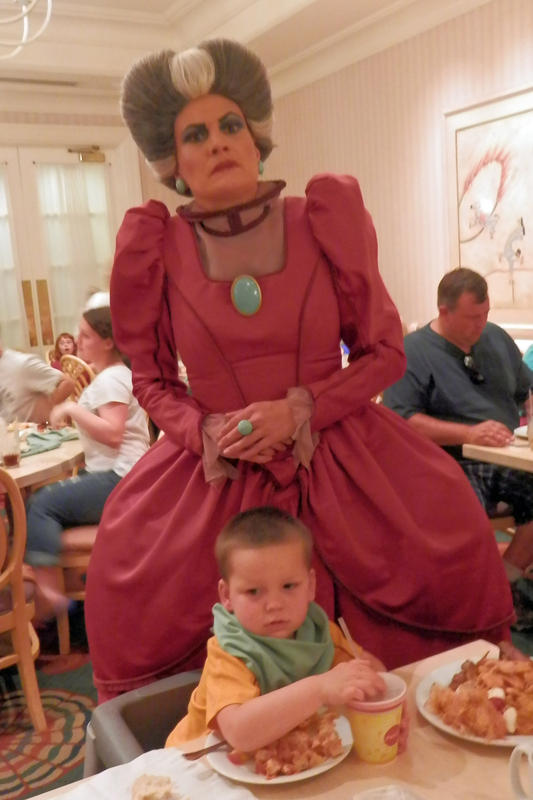 Tyler posed with Cinderella as well The food was our very least favorite; we had imagined the Grand Floridian to be the best. I ate a slice of pizza from the children’s buffet, enough said. Princess Kinsey and Princess Grace danced with Prince Charming and hugged and posed with Cinderella , they had become use to being treated as royalty. 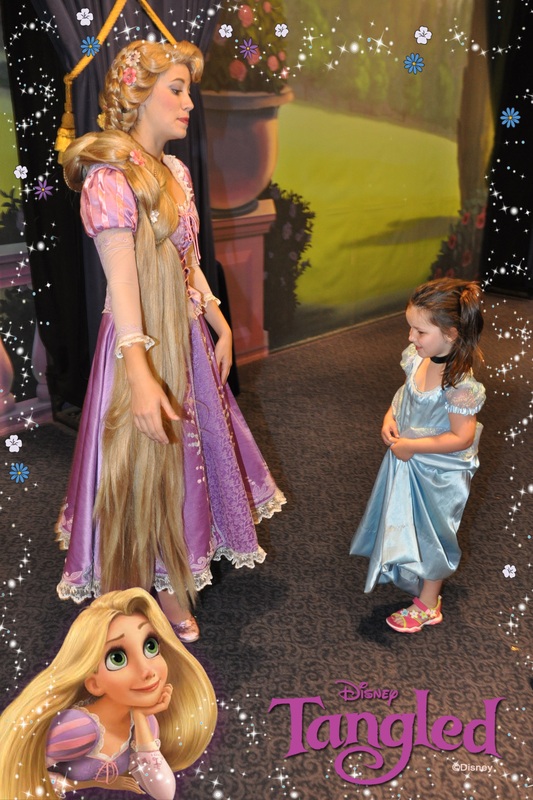 The Disney cast (from street cleaner, photographer, sales clerk, ticket taker, to every character) are all trained to bow or curtsy, offer respect and reverence and love every little princess. I saw a young sales clerk at the Disney Emporium bow on one knee in front of our Princess Grace; she looked him up and down and with a tiny smile dismissed him with a curtsy, her little hands holding her dress on both sides. I also witnessed Princess Grace being asked for her autograph, she happily granted their request. 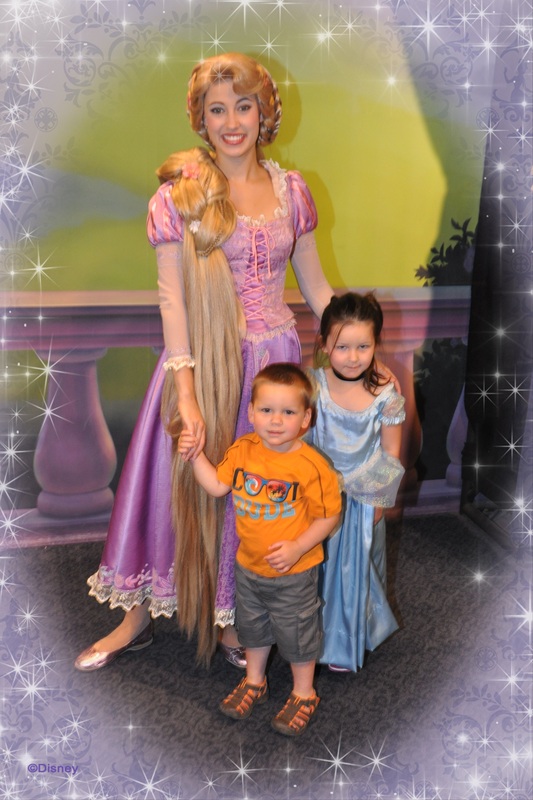 On the bus that transported us to and from the parks when a princess was aboard the announcement was given, “attention Disney vacationers, please make sure you are on your royal behavior because we have a princess on board”. As day 4, now evening, continued, we spent time with Courtney, Roy, Colton and Kinsey. We wanted Roy to experience the vintage Disney rides, he had been on every roller coaster from Space Mountain to Splash Mountain to Thunder Mountain (wow, I never realized Disney kind of has a thing for that “mountain” word ). 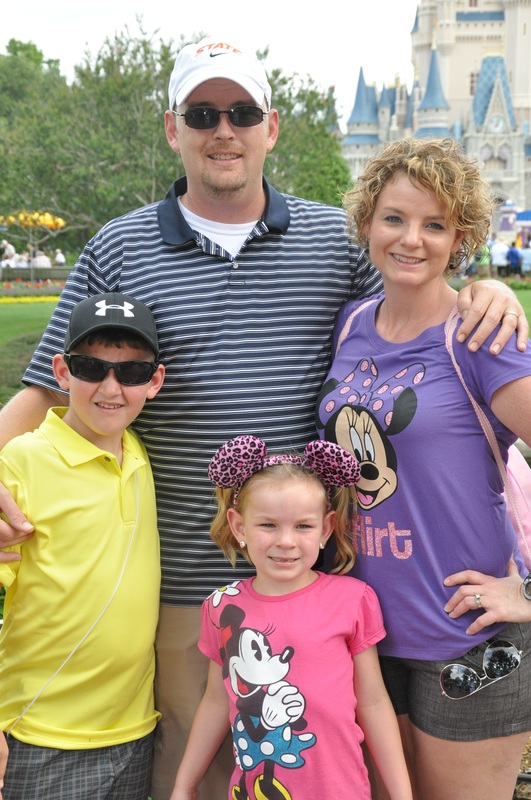 Roy, Courtney and I rode Pirates of the Caribbean and the Jungle Cruise, Disney classics. 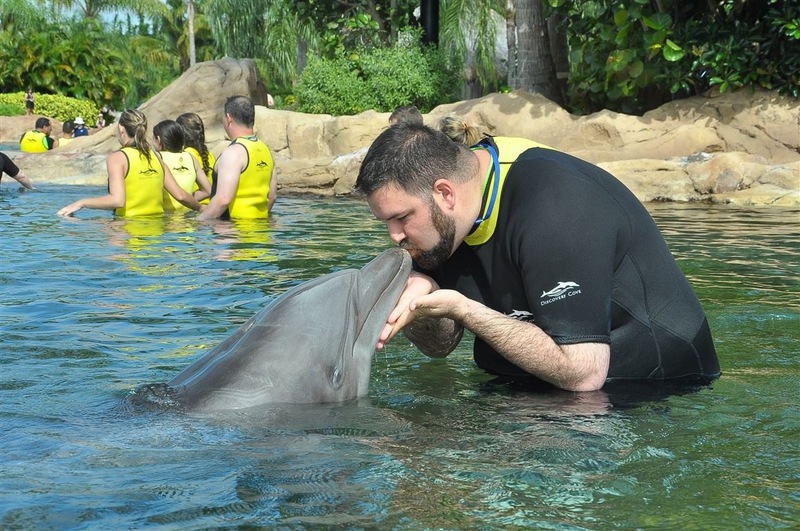 I had worried most about my son in-law, Roy, having a great Disney experience. This was his first time and not really his, for lack of a better phrase, cup of tea. Now that we are post-trip and he and Courtney are already planning a return trip I think that speaks volumes and makes me happy. Then all six of us rode “It’s A Small World” together, everyone loves that. 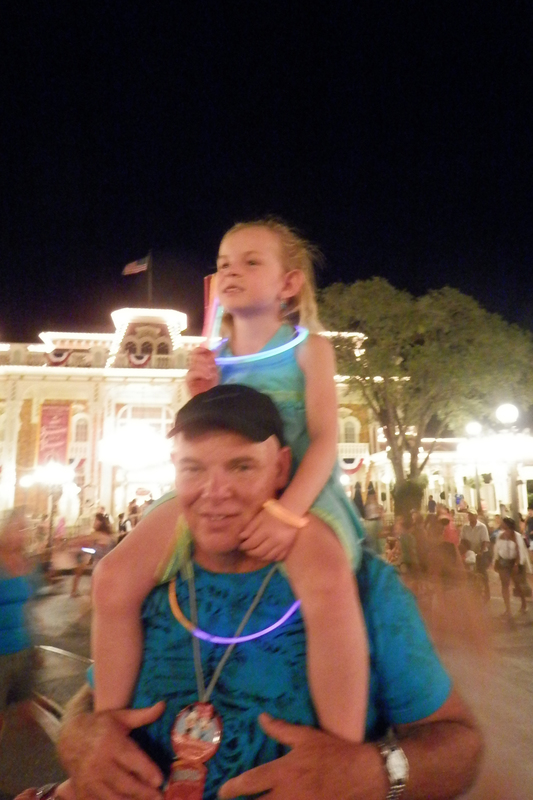 It was time for fireworks, Kinsey sat on Mike’s shoulders and we all watched the sky light up again. This might be a good time to mention my Colton. I feel certain he had a really great time, he used the word “awesome” too many times to count and I received many Colton hugs always with a “Nana thank you so much for bringing us”. I truly love all my grands the same, I have just known and loved Colton, the oldest, the longest. Jake, Eric and Tyler hung out together that evening. 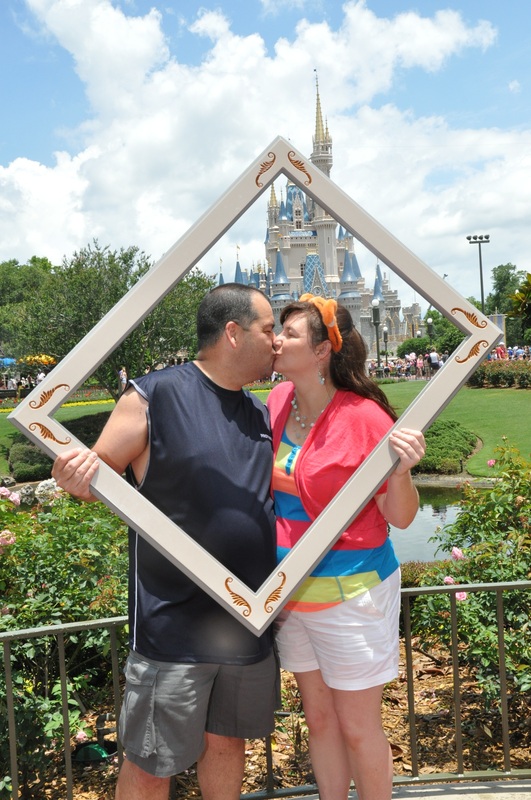 These two pics were not on our photo pass when we got home. 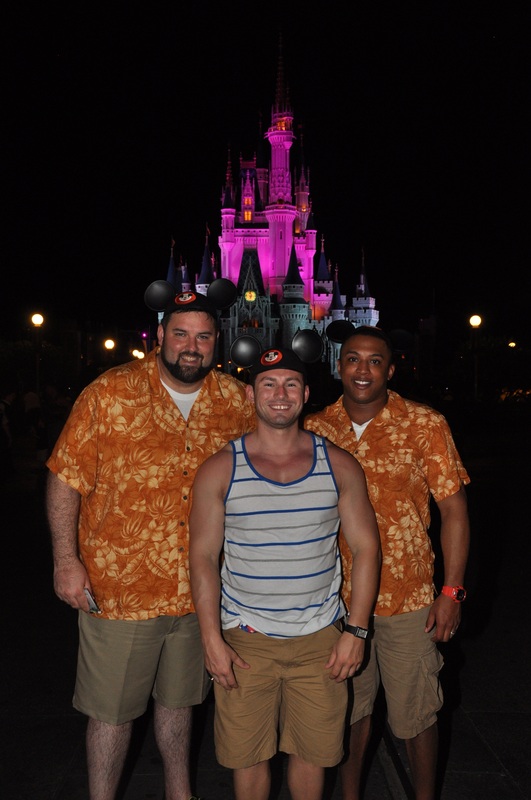 The guys remembered sporting their new Mickey hats and were disappointed this shot was lost. Mike made a phone call to Disney’s incredible photo department and together they tried to pinpoint a general time and location and among thousands of pictures taken that evening Disney’s people found the photos. 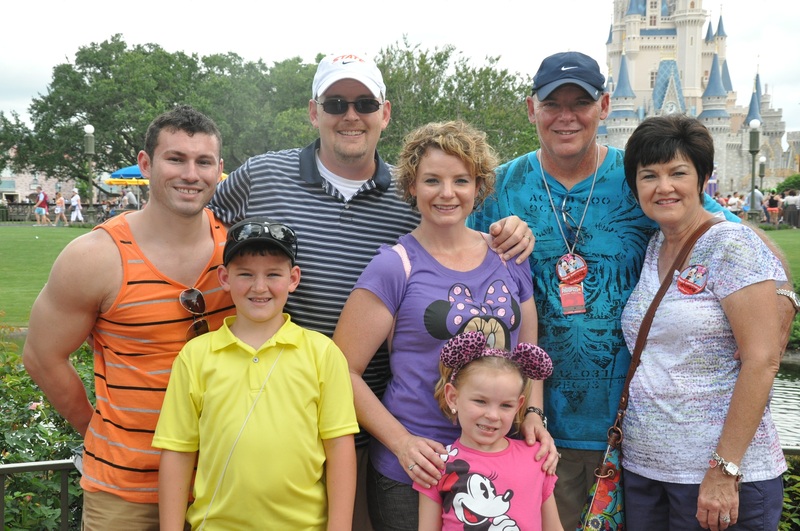 A little more of that Disney magic. .
After the fireworks we went different directions from the Branch family and miraculously happened upon Charity and her family. It is late evening and we are all anxious to enjoy some fun rides. Grace and I started with Dumbo. 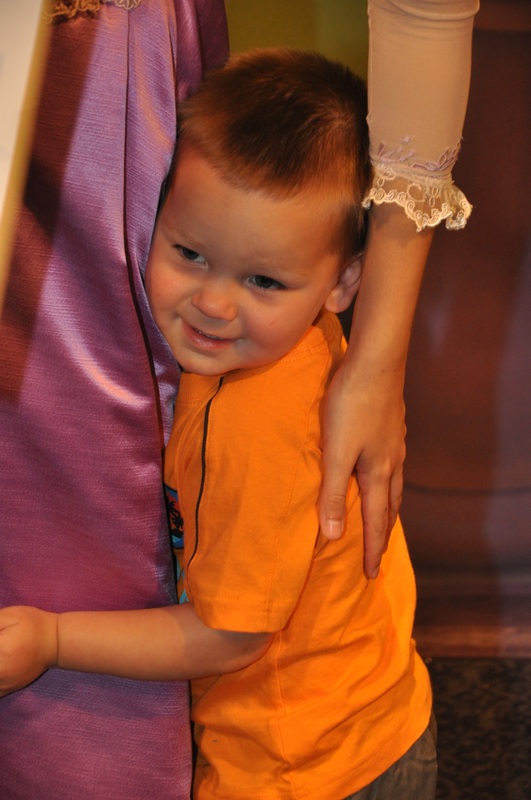 The Disney cast member helping with the Dumbo line was intrigued with Princess Grace, (Gracie was wearing her Cinderella gown again) and questioned her about her evening and her feelings toward Prince Charming. Princess Grace told her she had danced with him that very evening, the young line assistant admitted she too had a crush on Prince Charming and said she wished she could have been at The Grand Floridian and danced just like Gracie. Grace and I rode Dumbo two times, the sweet young men let us stay on and avoid the line. 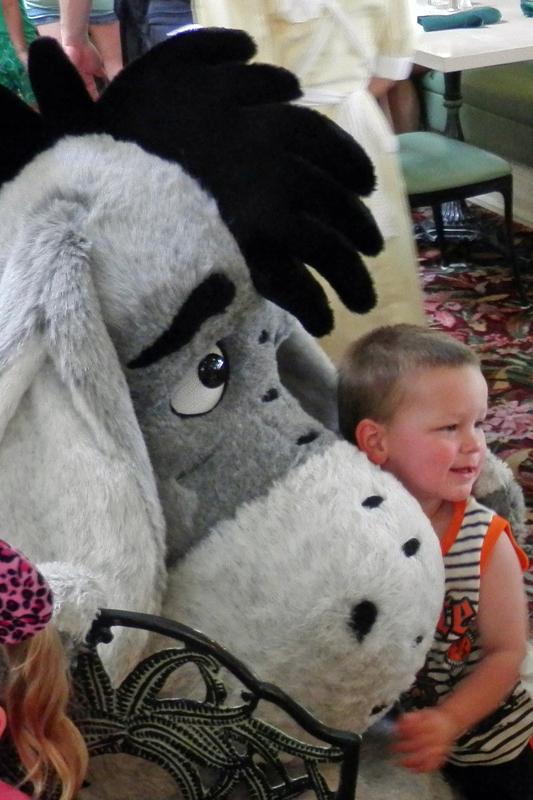 Not to be outdone Gracie then found her Grandad and asked to ride Barnstormer, twice for that one too. We made our way back to FantasyLand and all 6 of us rode Peter Pan, Charity and Mike finally riding just the two of them, Gabriel with Grandad, and I had the honor of Princess Grace. After another It’s A Small World we chose beautiful horses on The Carousel as our final ride of day 4. 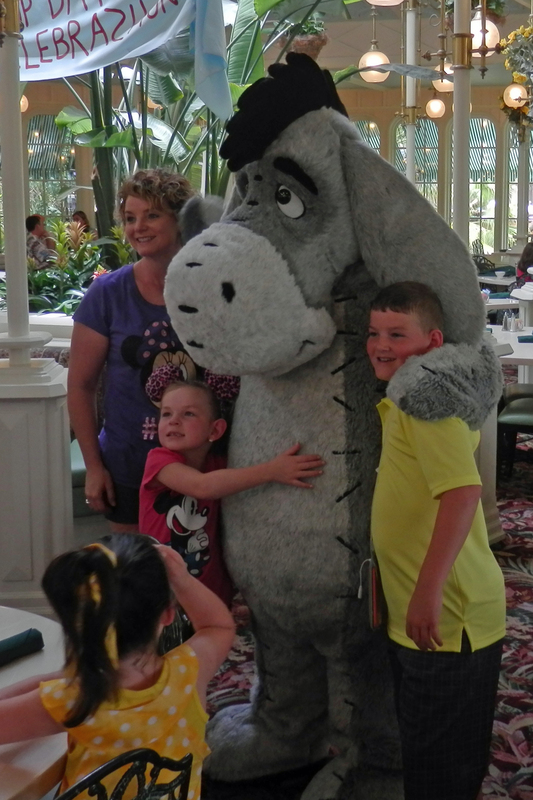 We stopped at The Disney Emporium as we headed to find our bus home, Grace and Gabriel had a nightly ritual of choosing their favorite character stuffed doll or animal to add to their collections. We closed Magic Kingdom as day 4 drew to a close. 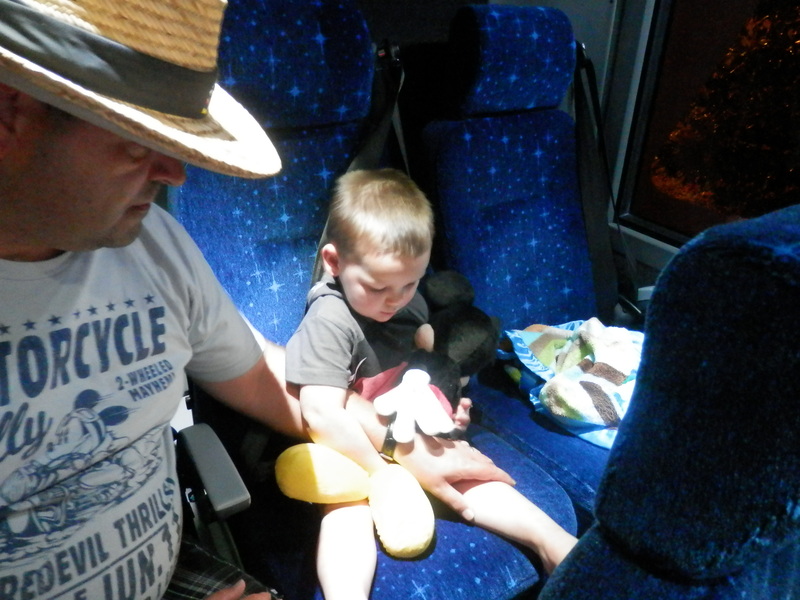 The Disney bus took us back to our resort which I have never described. 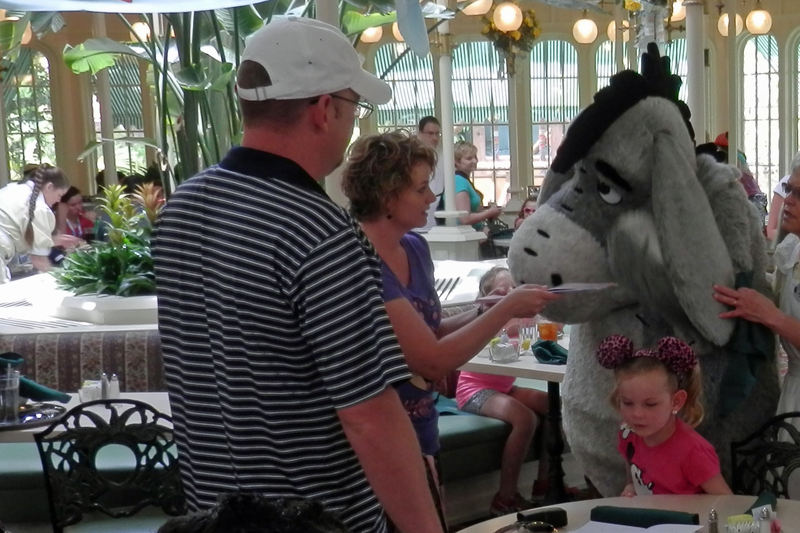 I mentioned it was called Saratoga Springs and was part of Disney’s Vacation Club Resort. Each of our four rooms had a spacious foyer, a nice kitchen, a living area with a large sofa bed and big flat screen TV, a balcony, a great size bedroom with another TV, a huge jacuzzi bathtub, a separate room for the shower, another room for the toilet, and a closet with a stackable washer and dryer. Very nice rooms and such a step up from our original rooms you would need a tall ladder. If you are a lucky and truly blessed person you have a circle of people you will love forever. To borrow a phrase one of the people in my circle used today, you have a “forever friend”. Often time or distance or circumstance kept us apart. Family, work and everyday life took priority, and appropriately so. But I have found when you have a forever friend all the space and time that has separated you melts away when there is a need. Attending the memorial service for the sister of one of my forever friends has given me cause for reflection. Big sisters are special and I enjoyed hearing two of her nephews share their memories. I too have fond memories of this unique lady. She was in my life when my forever friend and I were teenagers. I always thought she was “cool”, she never told us we couldn’t do something. She would usually insinuate that if we believed we were old enough and smart enough we should go for it. Looking back she may have been using psychology on us. I loved and admired the fact that she seemed to always have a “cause”. She was an easy person to love, a characteristic I think is not learned but God-given. She will be remembered and missed, two things we should all aspire to be. My forever friend was a great little sister, she can be proud of the time and love she willingly gave. I will close by saying thank you to my forever friend, I am glad you are in my circle and I will always always always be there for you.